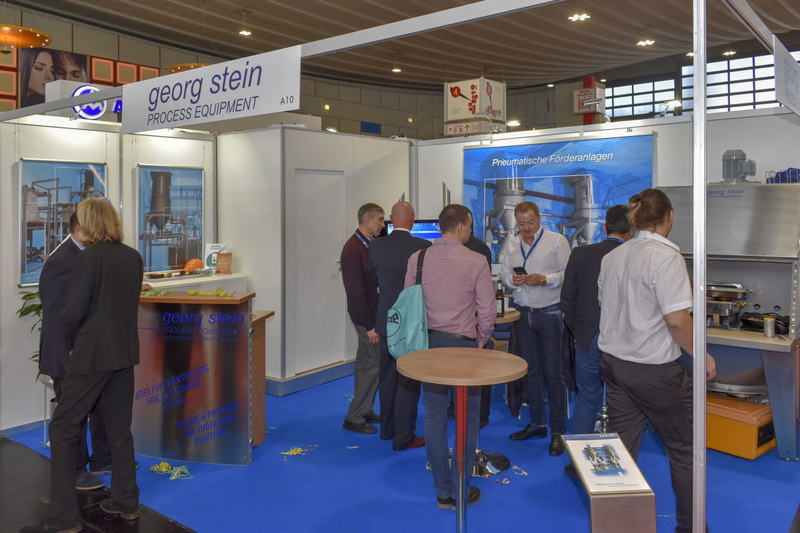 As in previous years, The Powder/Bulk Portal presents a Photo Gallery with a few selected exhibitors. 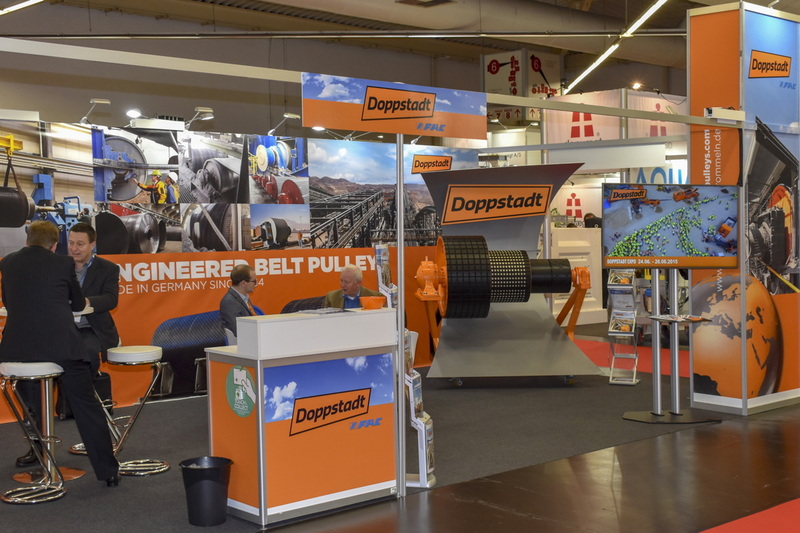 A click on any of the company names below will take you directly to the respective photographs. 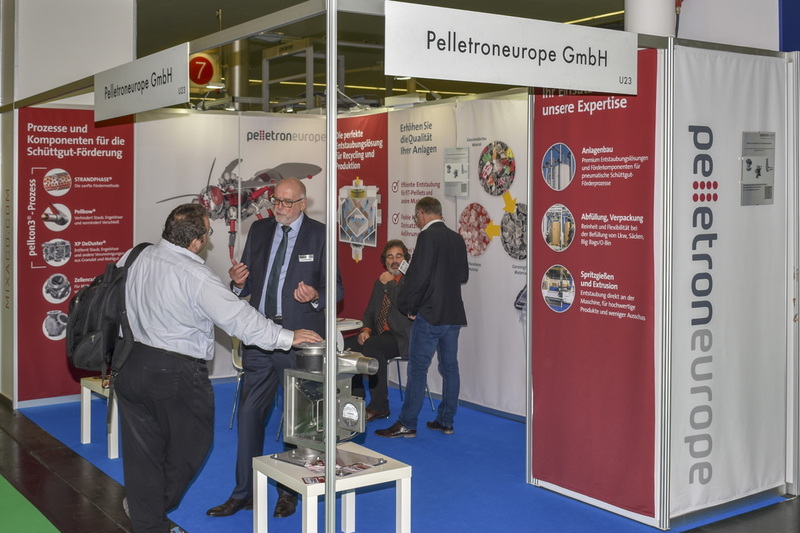 We invite your feedback with corrections and additions of missing names, also for the respective eDirectory listings. 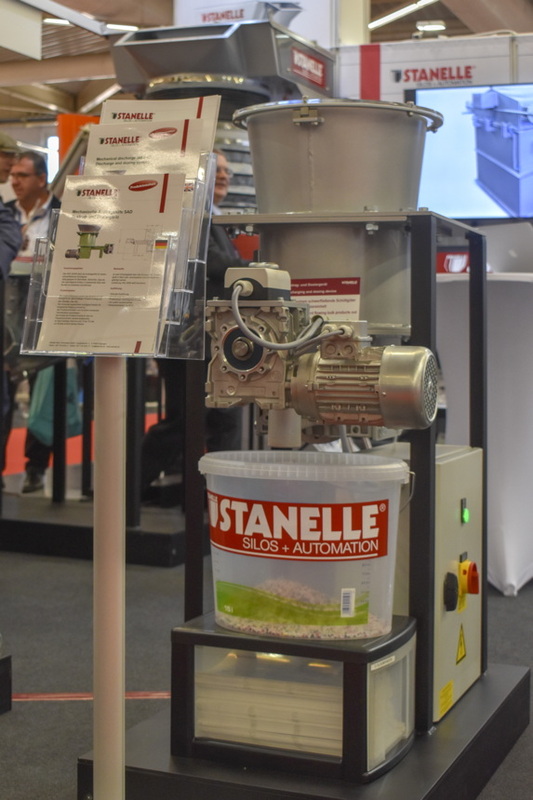 Please email your comments to marcel@bulk-online.com. 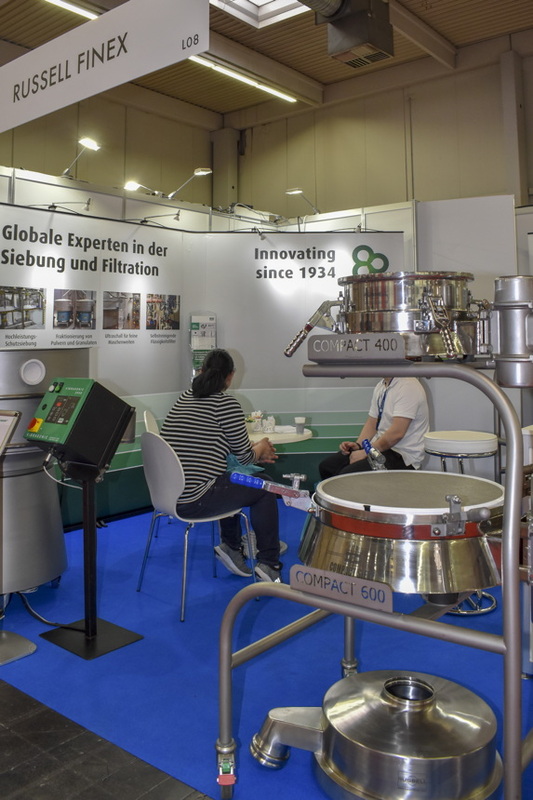 Brabender Technologie is one of the world’s leading feeder suppliers to all bulk ingredient processing industries. 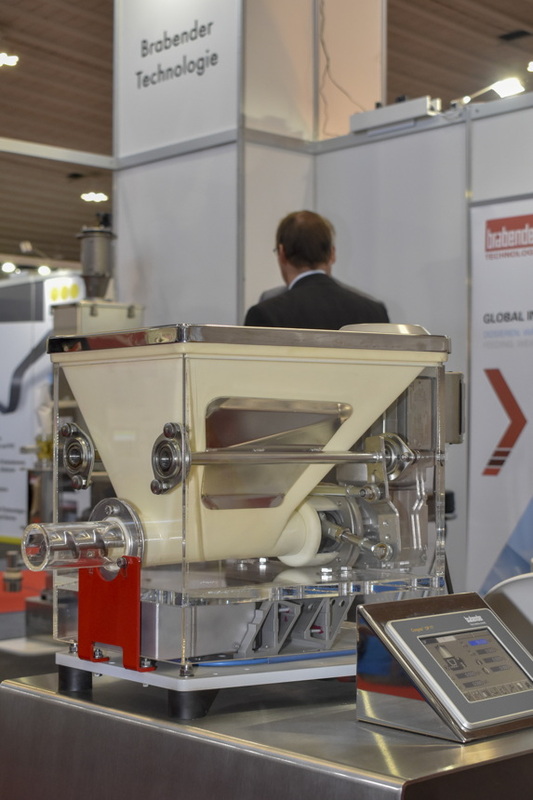 Brabender Technologie offer high-tech gravimetric and volumetric feeders for the complete range of bulk ingredients. 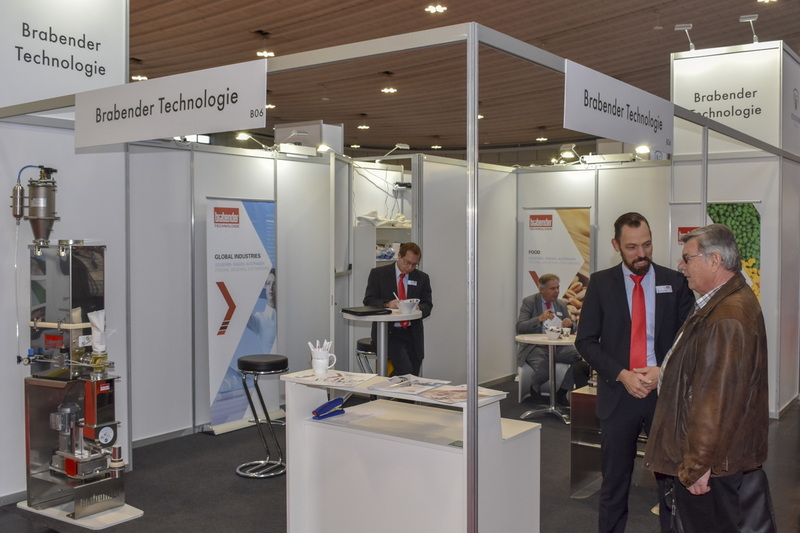 About Brabender Technologie: Brabender Technologie is a leading supplier of machinery and systems for bulk ingredient feeding, weighing and discharging with a world-wide consulting, sales and service network. 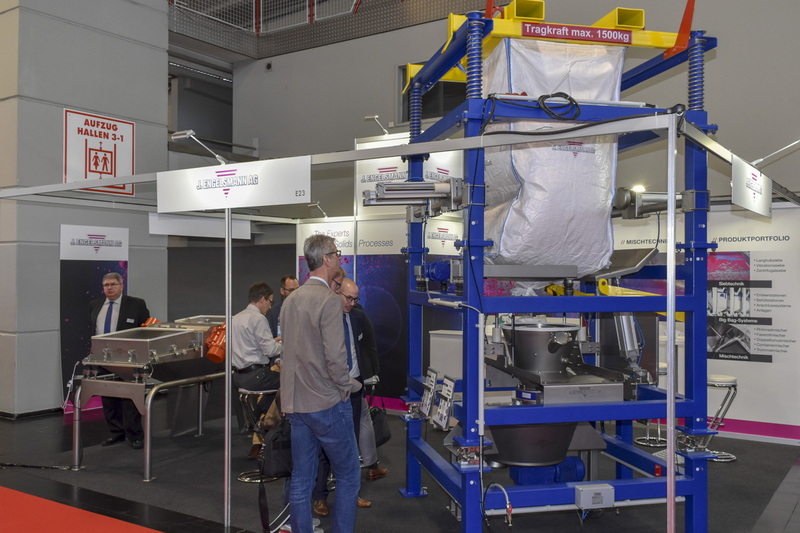 Flexicon has been active in the design and manufacture of bulk handling equipment, custom-engineered and integrated plant-wide systems since 1974. 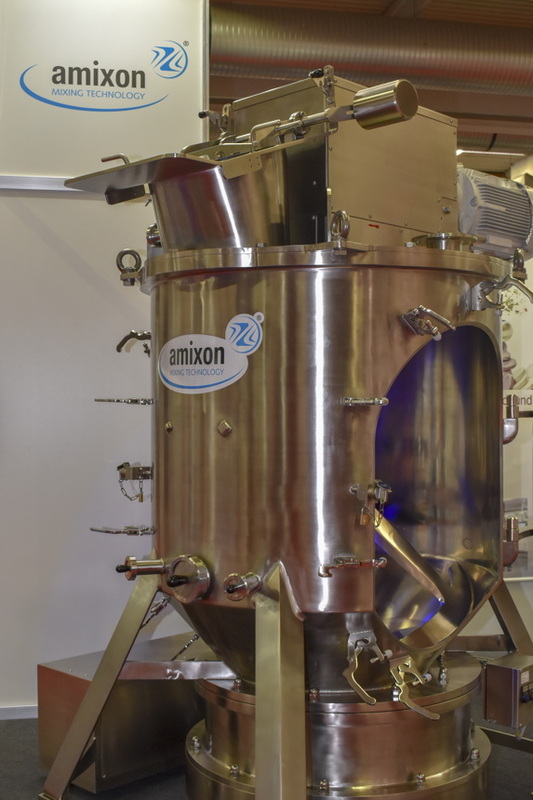 Felxicon offers equipment in carbon steel or in stainless steel finished to industrial food, dairy or pharmaceutical standards. 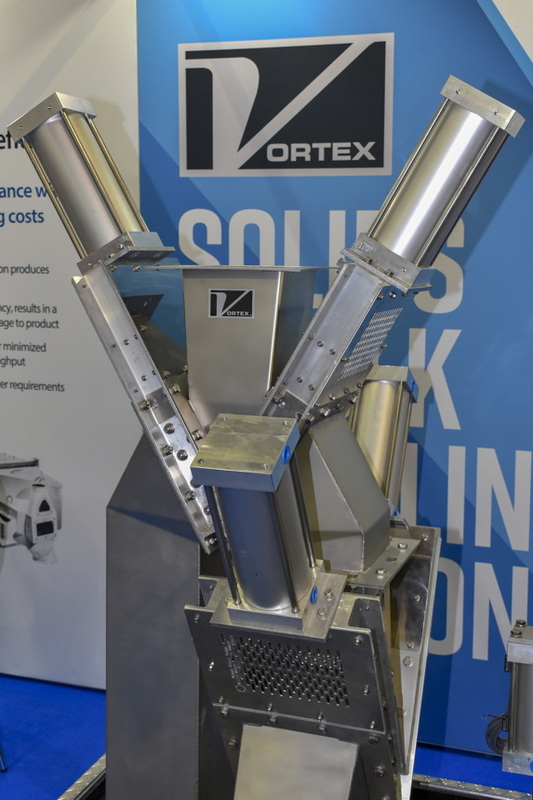 Flexicon also offers custom-engineered automated, plant-wide bulk handling and processing systems that integrate Flexicon equipment with equipment of other manufacturers. 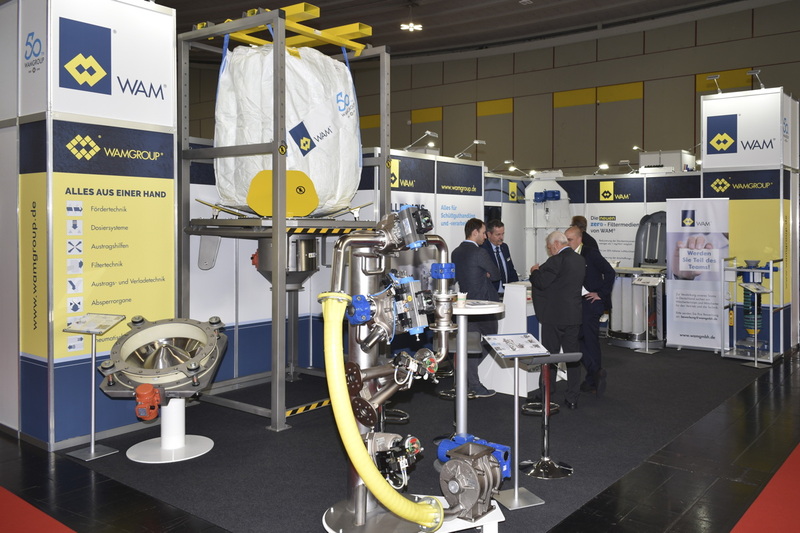 About Flexicon (Europe): Flexicon (Europe) is a subsidiary of Flexicon Corporation, a world leader in the design and manufacture of bulk handling equipment and custom-engineered and integrated plant-wide systems that transport, discharge, fill, weigh, blend, deliver and/or feed a broad range of powder and bulk solid materials. 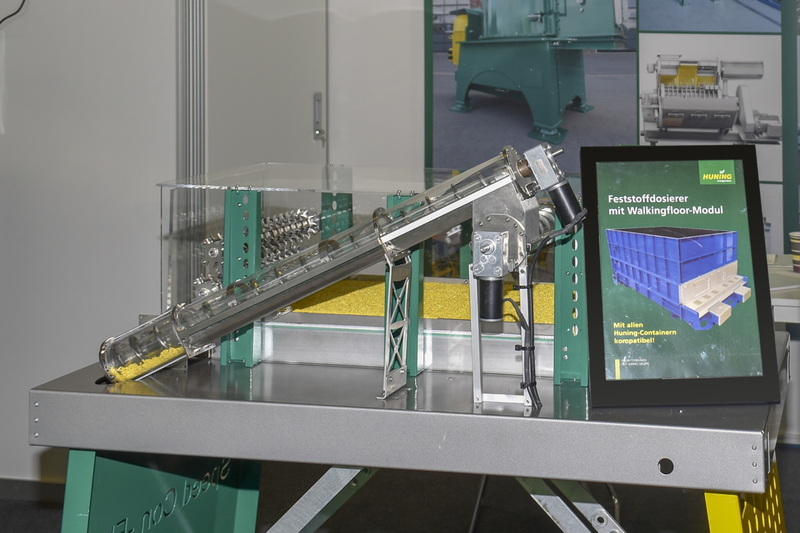 Flexicon products range from individual equipment to automated systems that source bulk material from interior and exterior plant locations, transport it between process equipment and storage vessels, weigh it, blend it, feed it to packaging lines, extruders, molding machines and storage vessels, and load it into railcars and trailers. 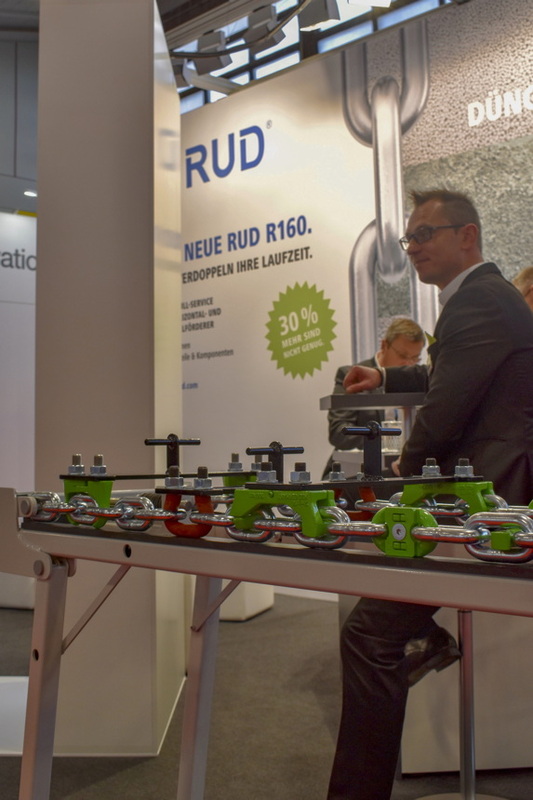 FLSmidth’s Pneumatic Transport group offers innovative technology and broad experience in all aspects of material handling systems. 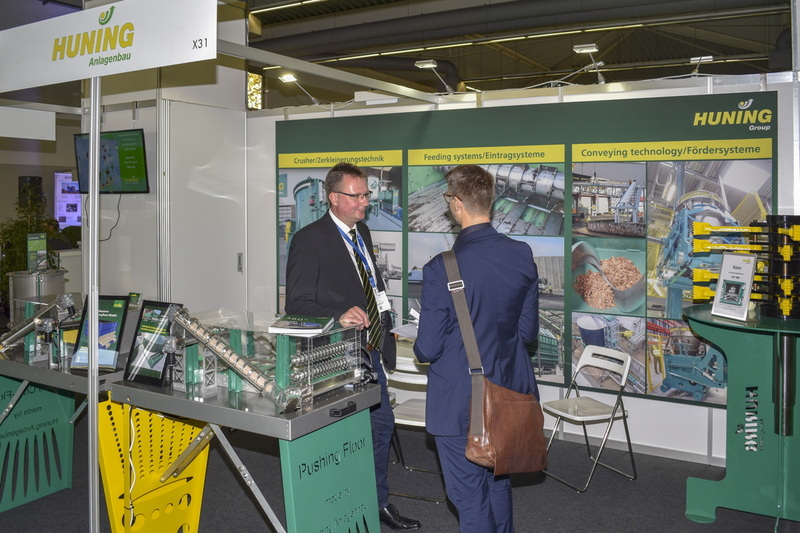 About FLSmidth: FLSmidth‘s Pneumatic Transport group is a worldwide leader in pneumatic bulk conveying for the process and materials handling industries. 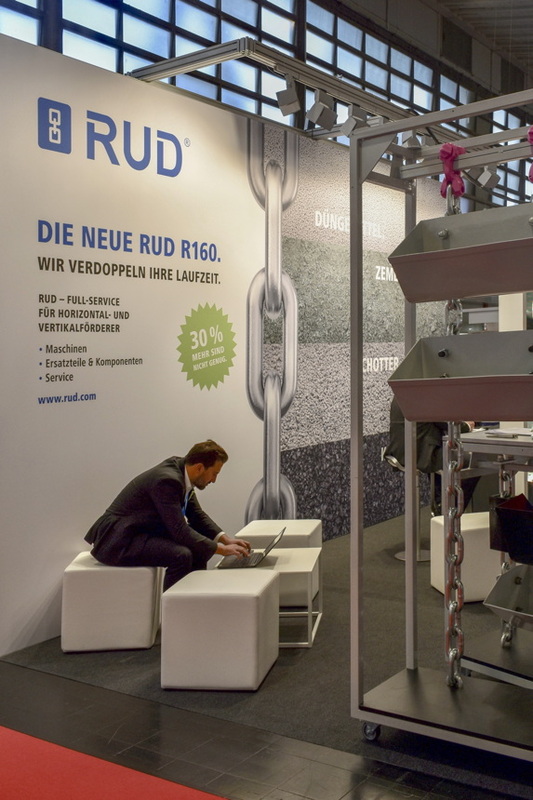 The company offers innovative technology and broad experience in all aspects of material handling systems. 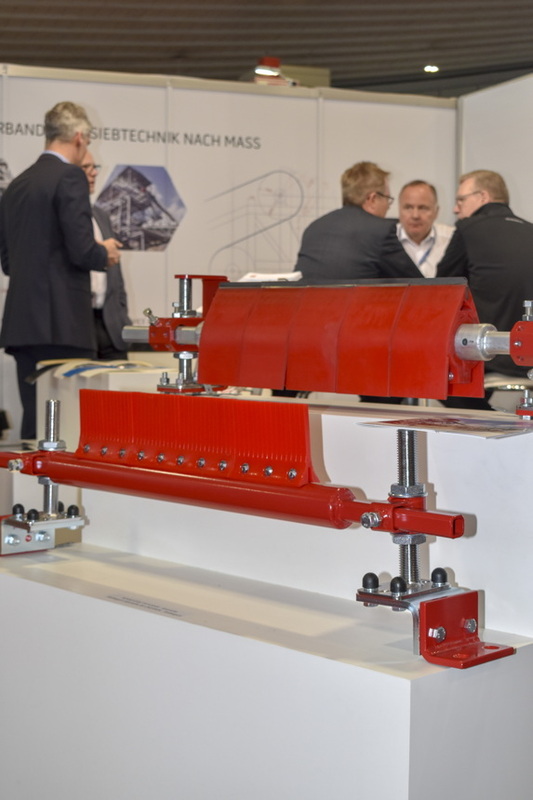 Since its founding as Fuller Company in 1926, FLSmidth‘s pneumatic conveying systems have moved millions of tons of dry bulk solids in numerous applications. 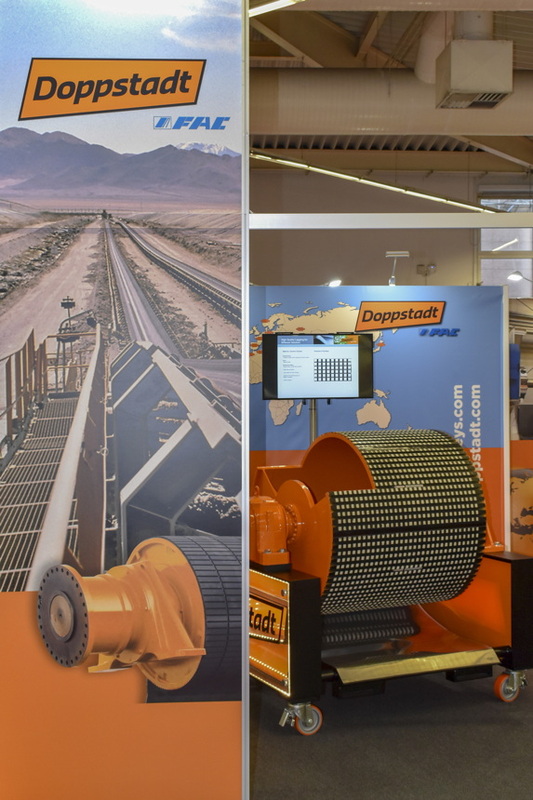 Modern, efficient technology and proven equipment are only two of the company’s strengths. 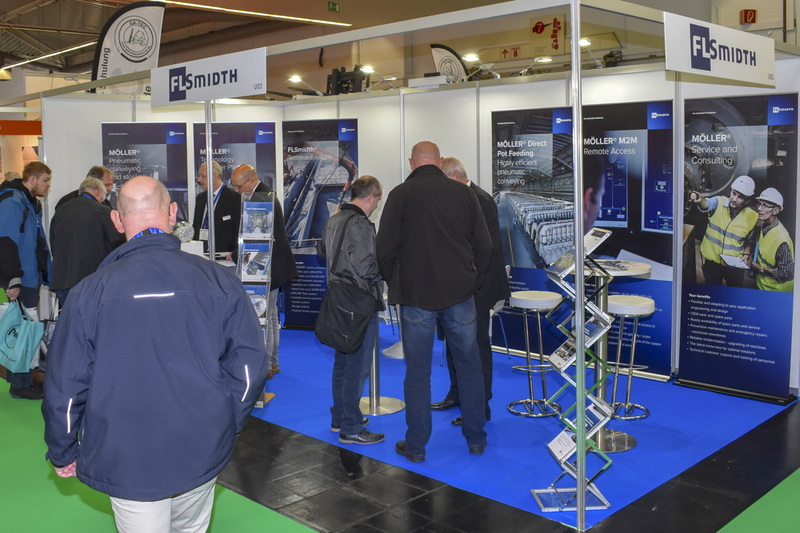 FLSmidth‘s excels at system design, engineering and supply of complete bulk material transfer systems. 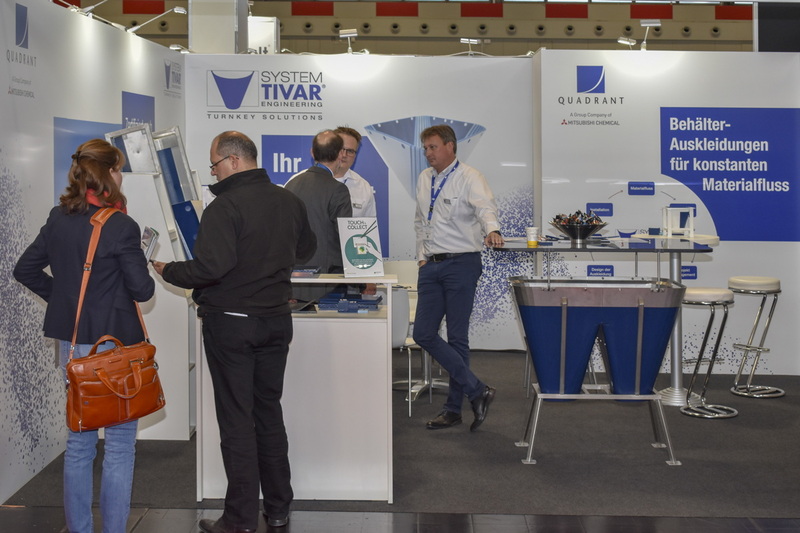 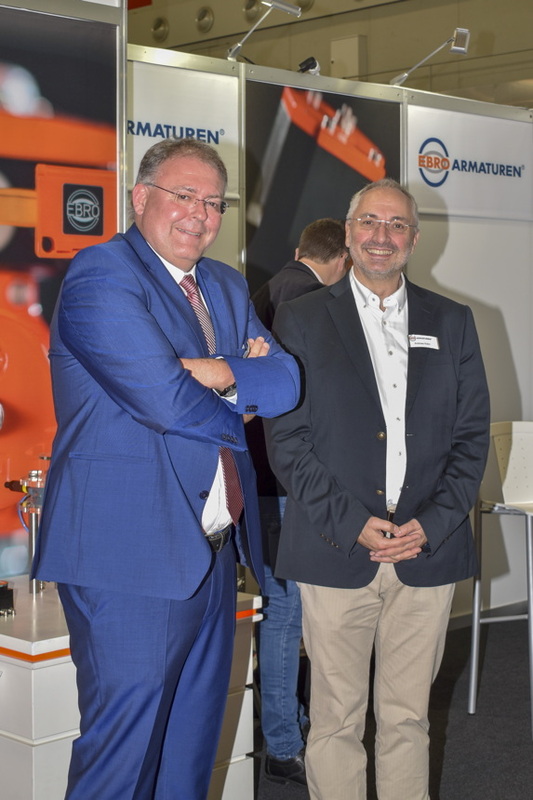 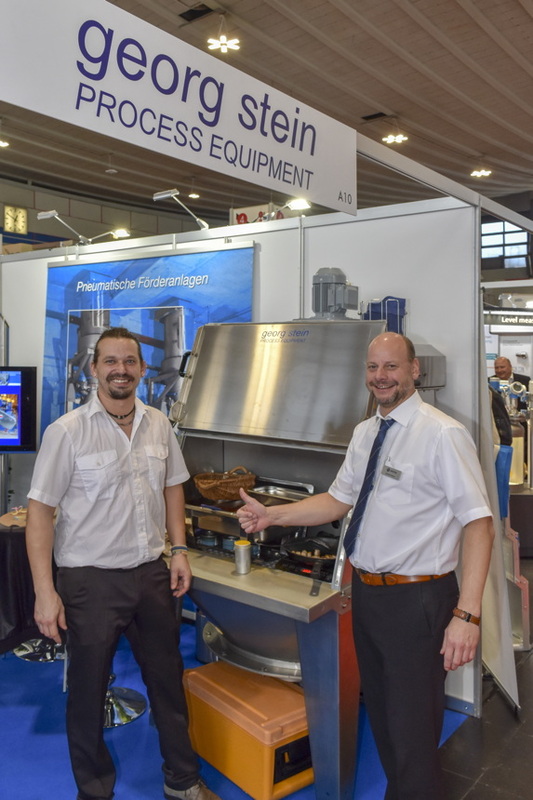 Thomas Olf (left), Managing Director of CleanScrape GmbH and Michael Tenzer (tight), Business Development Manager at Martin Engineering GmbH. 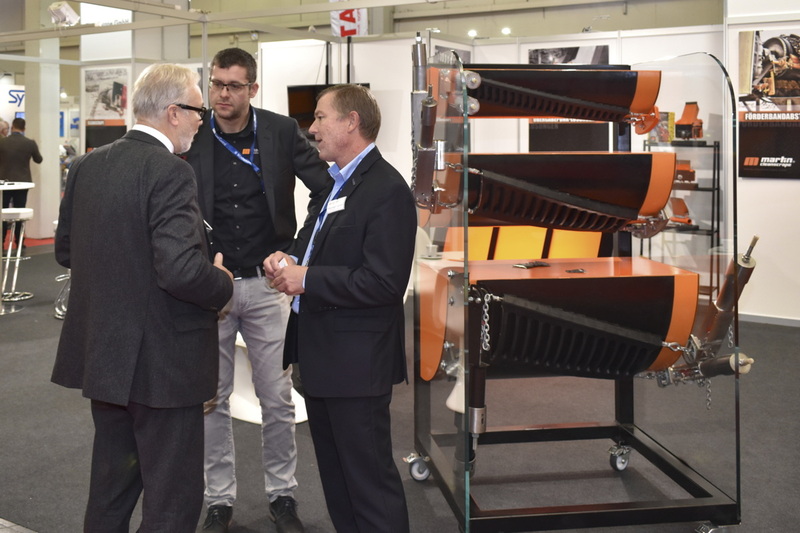 Thomas Olf and Michael Tänzer in conversation with Jochen Baumgartner, Managing Director of BSB+P Communications and Publisher of the Germany journal “SCHÜTTGUT&PROZESS”. 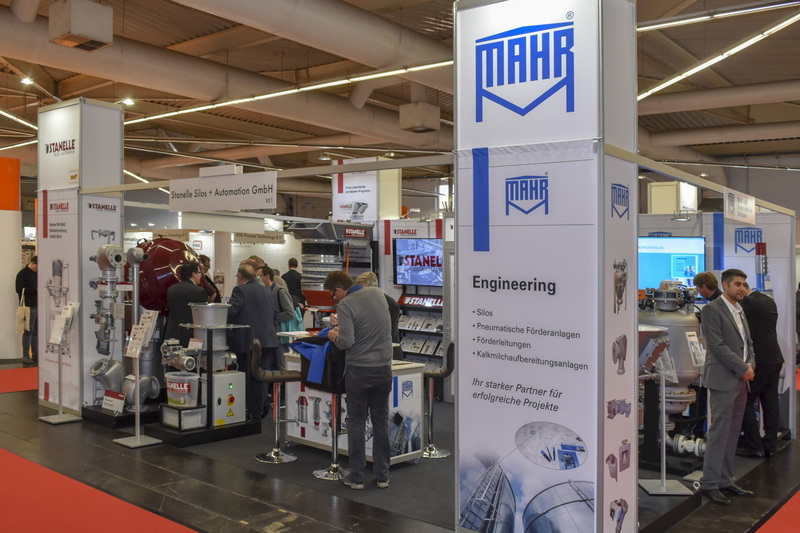 About Martin Engineering: Established in 1944, Martin Engineering is the leading international developer, manufacturer and supplier of innovations to make the handling of bulk materials cleaner, safer and more productive. 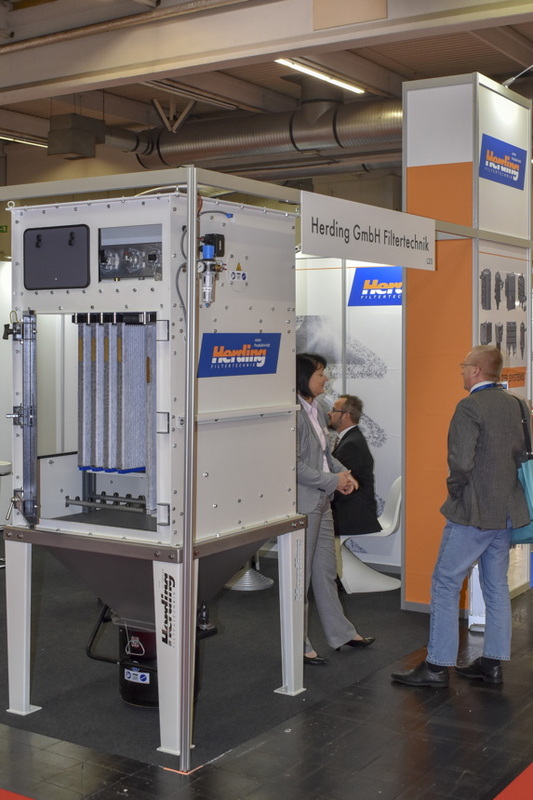 Martin offers technologies that boost flow, reduce dust and spillage, extend component life and reduce downtime, resulting in improved operating environments and increased profitability. 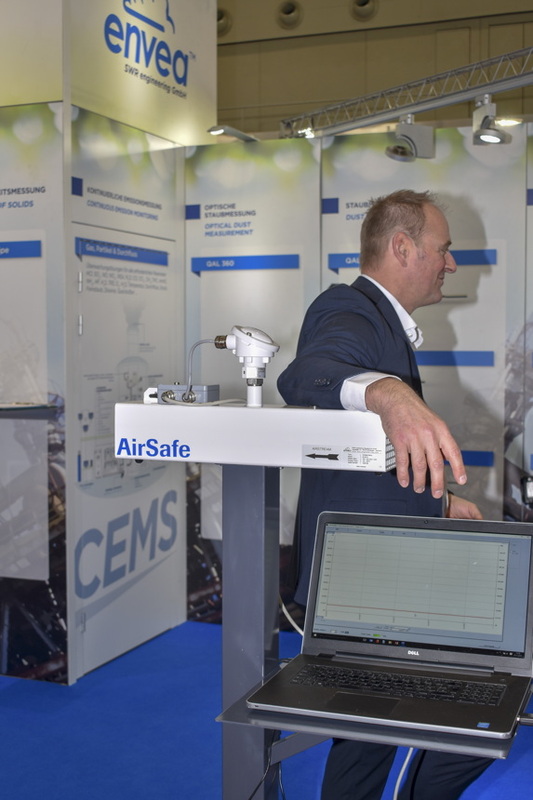 REMBE offers cross-sector safety concepts for all types of plants and equipment. 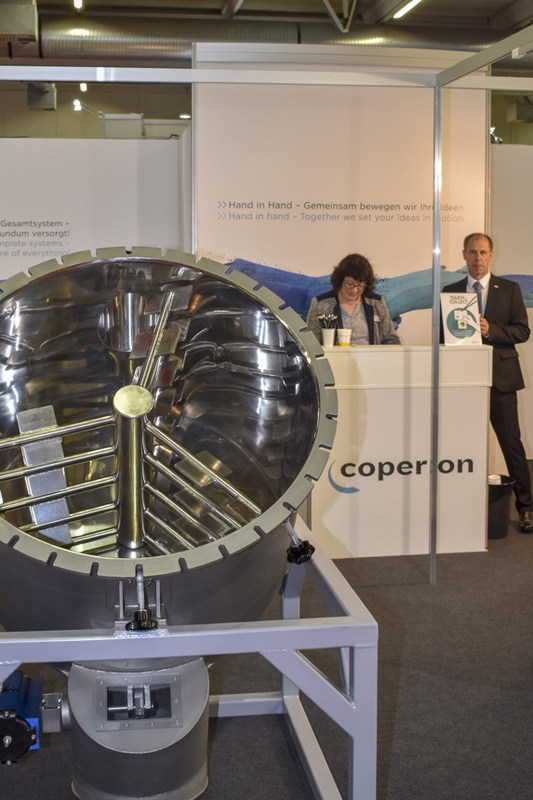 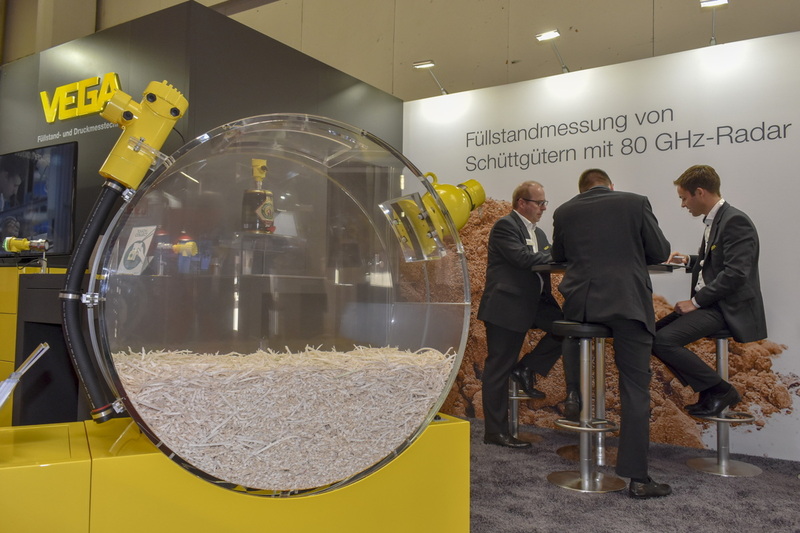 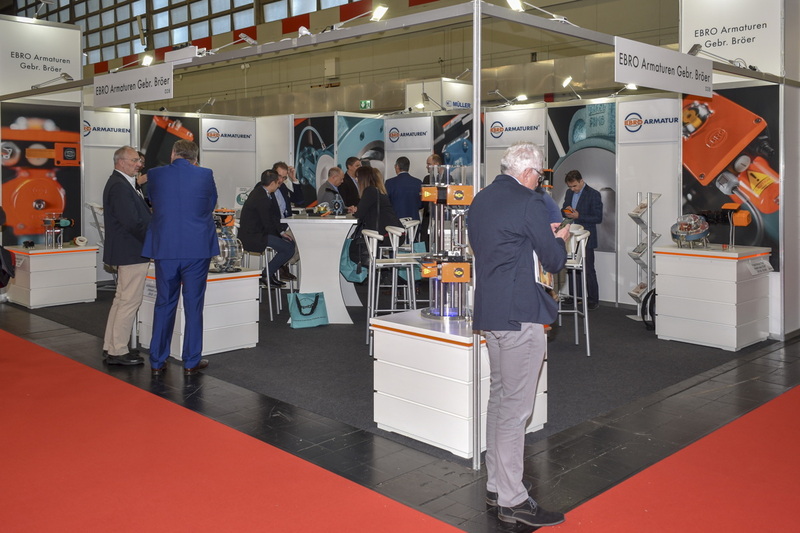 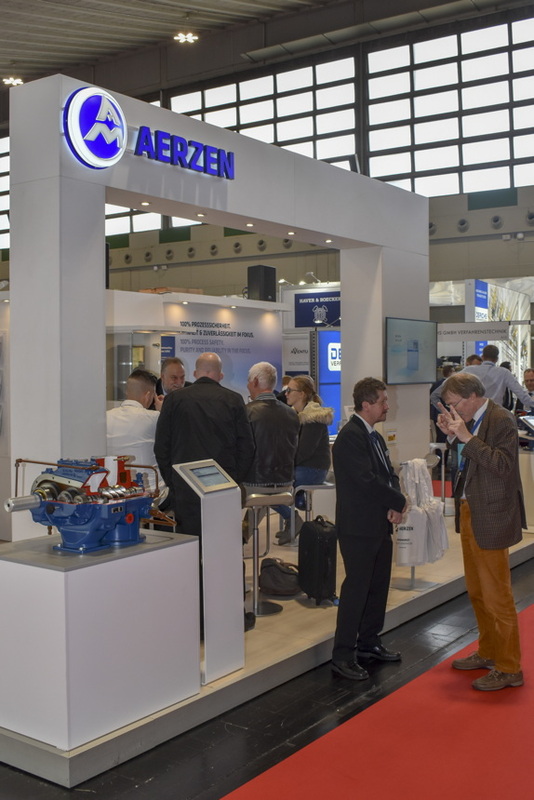 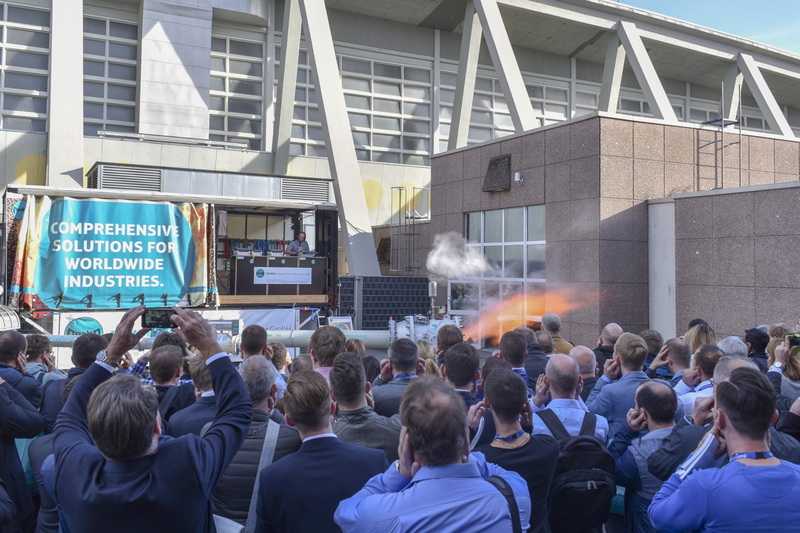 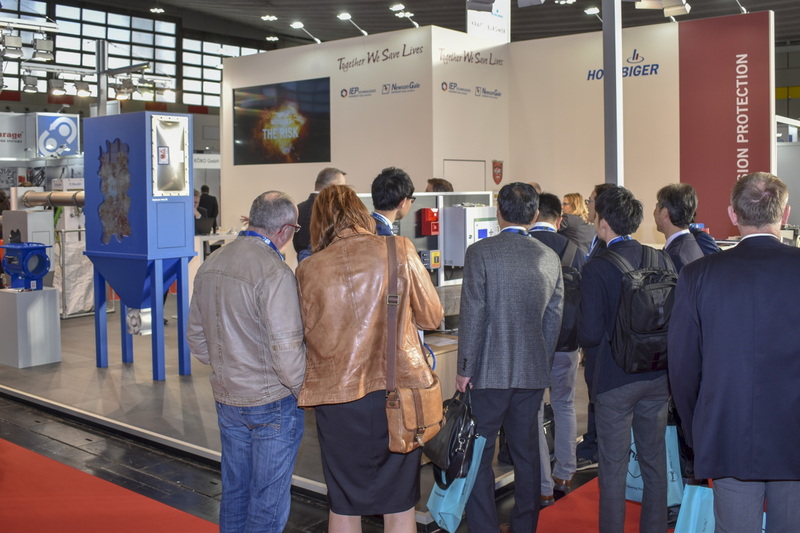 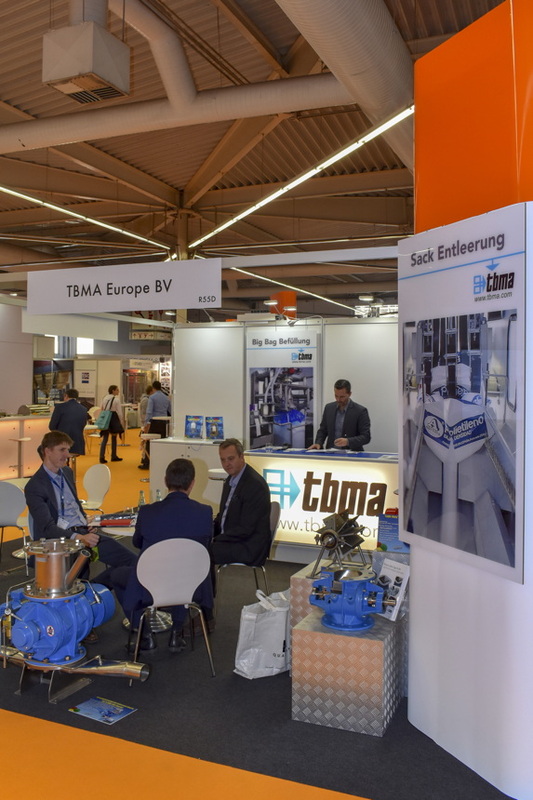 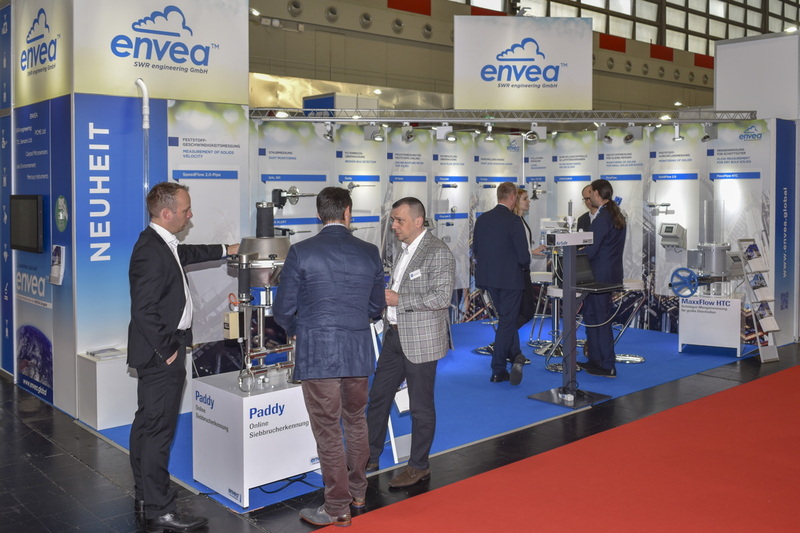 The absolute top attractions of Solids Dortmund 2018 were the live explosions carried out by Rembe during the 4th German Fire and Explosion Protection Congress. 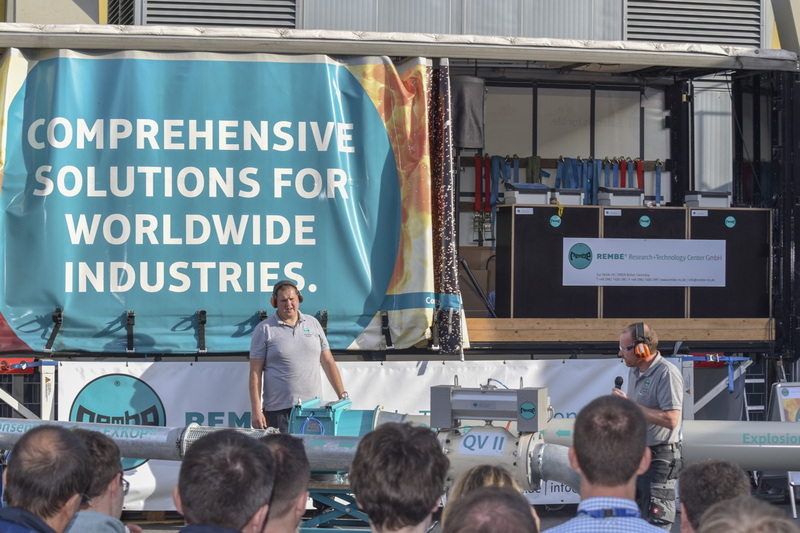 The REMBE live presentations impressively demonstrate the destructive power of dust explosions. 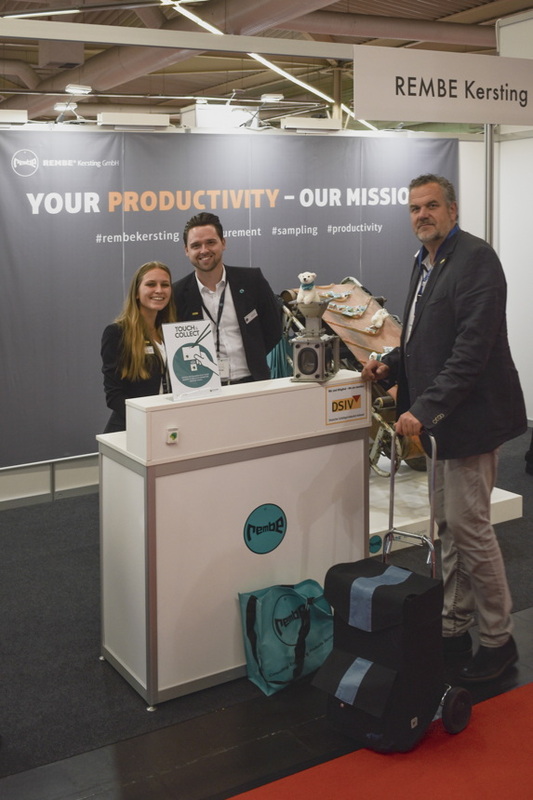 Mara Tschentscher, Marketing, and Alexander Kemmling, Technical Sales, both REMBE® Kersting GmbH, together with Michael Schardt, Media Consultant at BSB+P Communications. 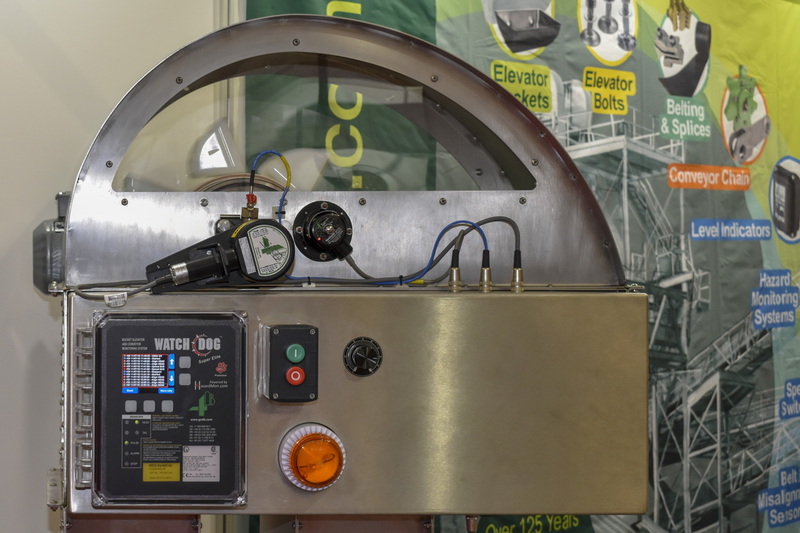 Primarily designed for elevators and screeners, the Rembe Q-Ball uses the contour parallel venting principle to guarantee maximum flameless explosion venting effectiveness. 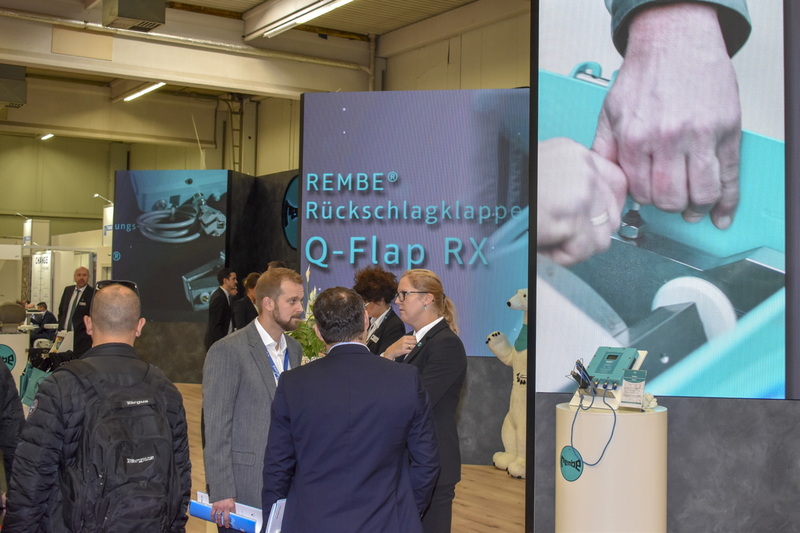 About REMBE: REMBE® is a safety specialist in pressure relief and explosion safety. 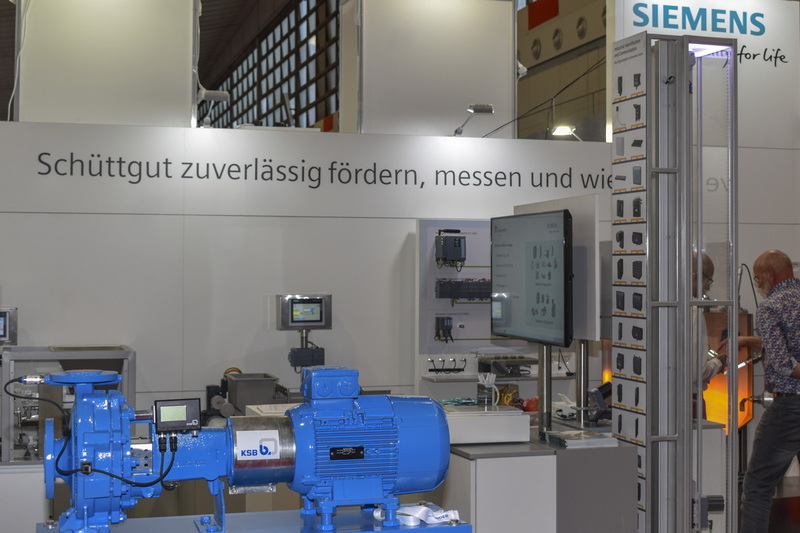 It provides customers in all industries with safety systems for their plants and equipment. 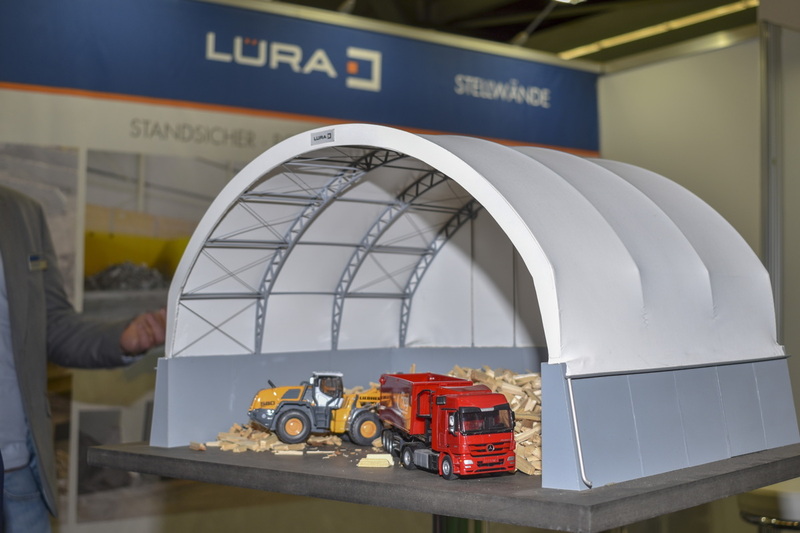 All products are made in Germany and meet the requirements of national and international regulations. 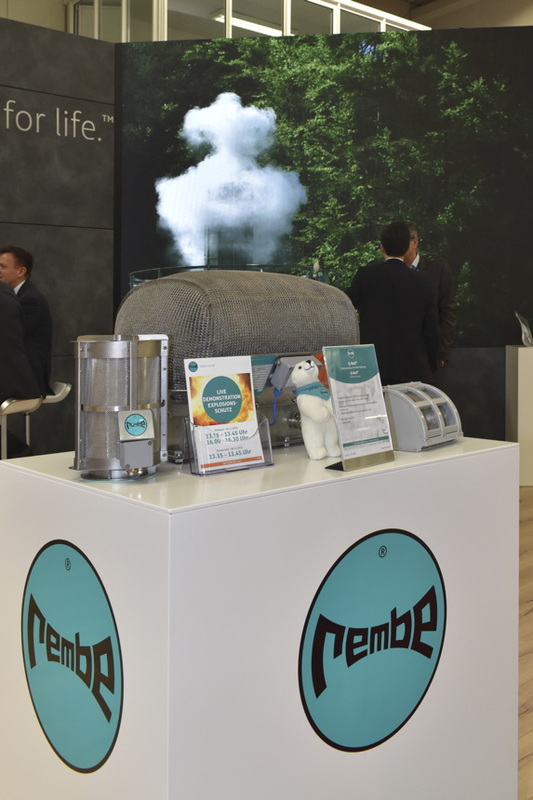 REMBE® customers include market leaders in numerous sectors, such as the food, wood, oil and gas, chemical, pharmaceutical and petrochemical industries. 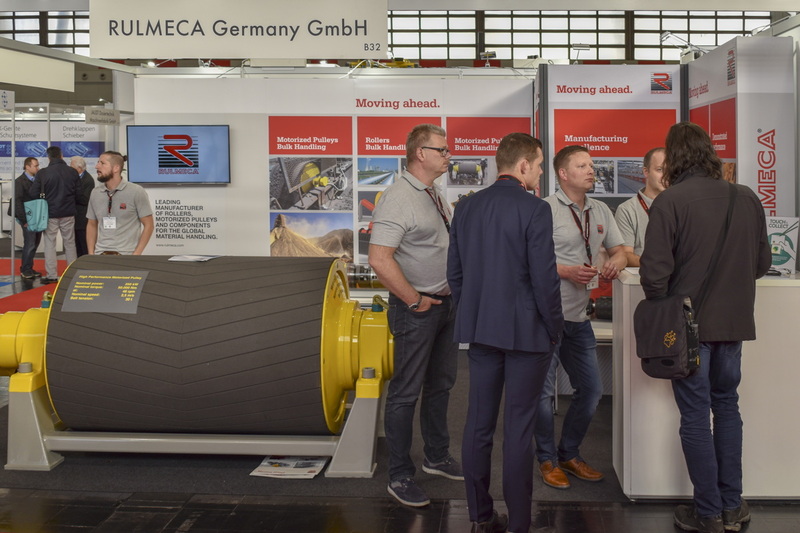 REMBE® takes a comprehensive approach, primarily developing and making its own products while also providing the relevant consultancy, engineering and service. 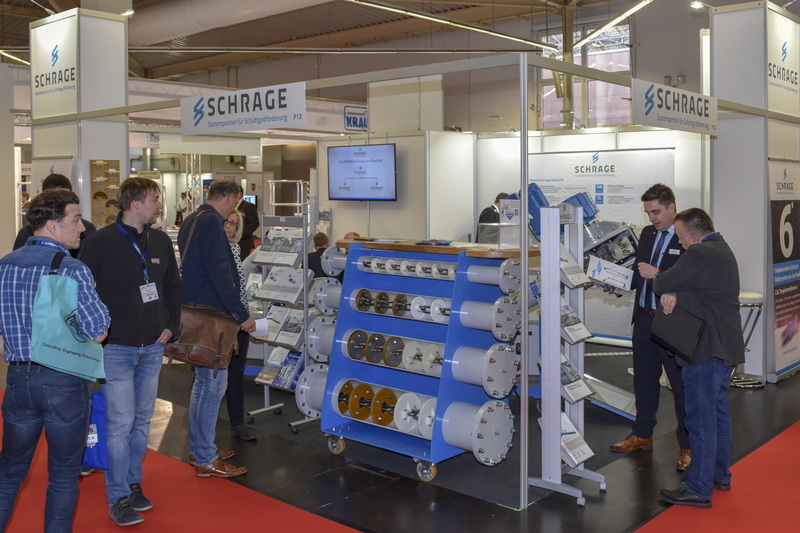 Schenck Process develops and manufactures solutions for weighing, feeding, conveying, screening, automation, and air filtration applications. 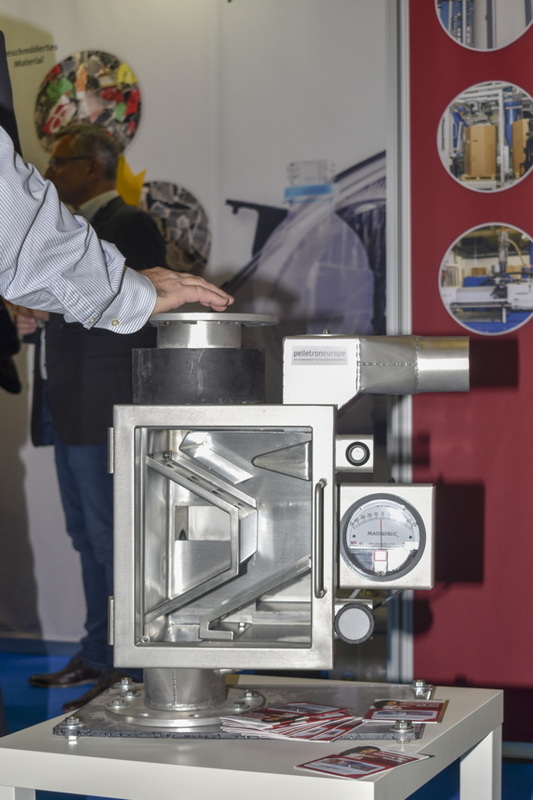 Schenck Process’ expertise in weighing and feeding ranges from the smallest quantities in the range of 20 g/h for pharmaceutical applications to 20,000 t/h for mining and logistics applications. 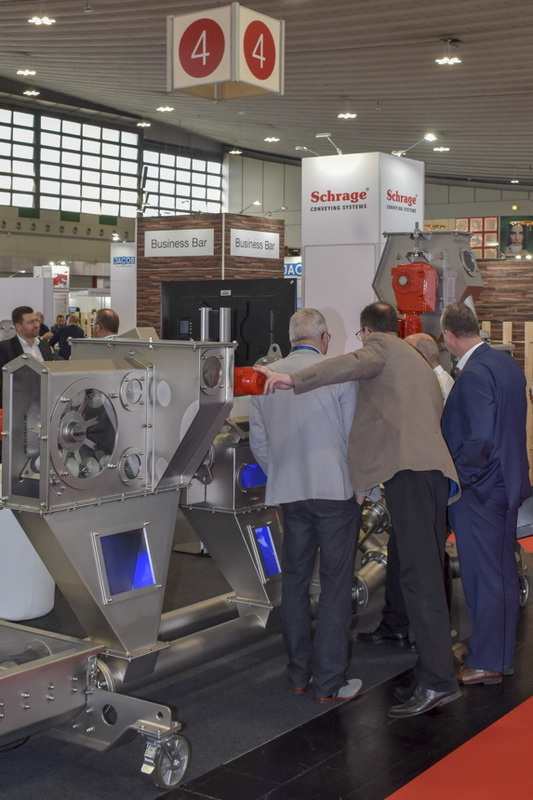 About Schenck Process: Schenck Process is the complete global source of highly accurate bulk materials handling solutions including pneumatic conveying and injection, mechanical conveying, weighing and feeding, vibrating screens and feeders, and dust filtration. 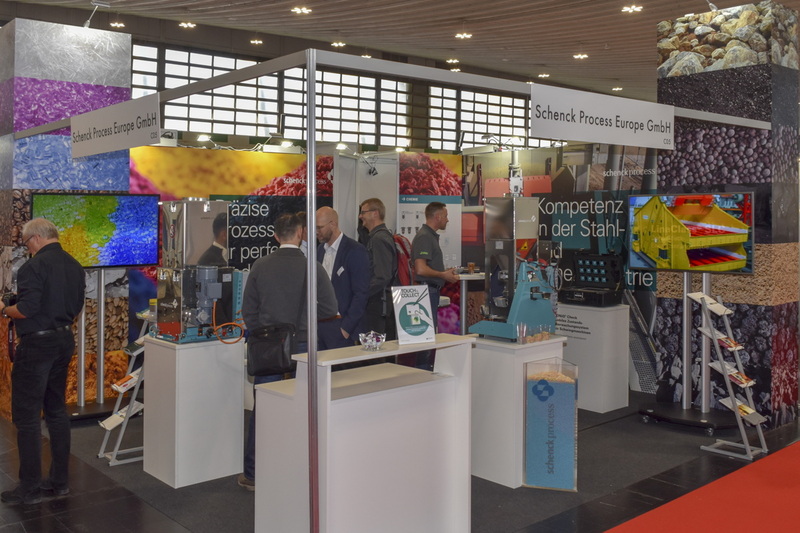 With sales, service and manufacturing locations throughout the world, Schenck Process is able to deliver process solutions to international customers. 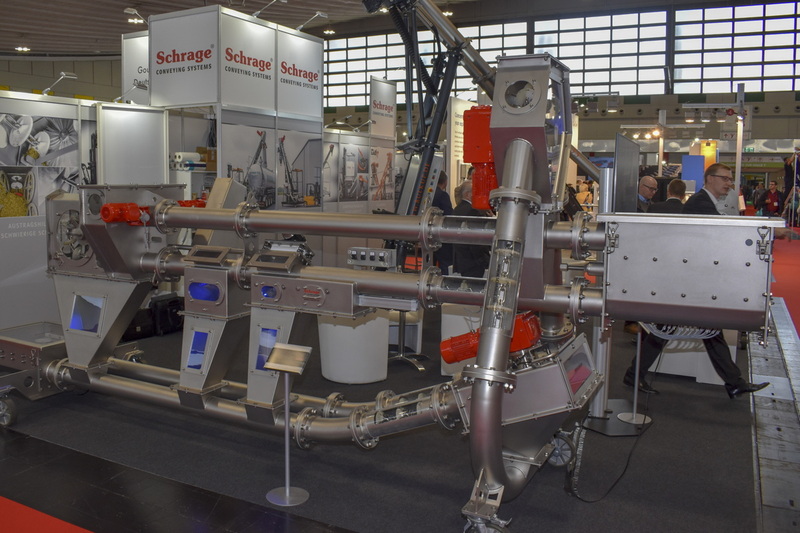 The name Schenck Process stands for more than 135 years of experience and innovation. 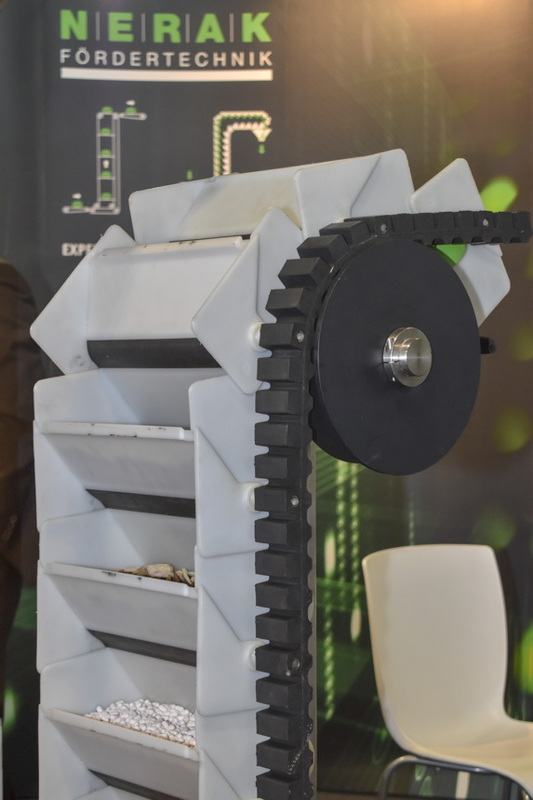 A strong brand, today the company, founded as an iron foundry and weighing machine factory, is one of the global market leaders in measuring and process technology. 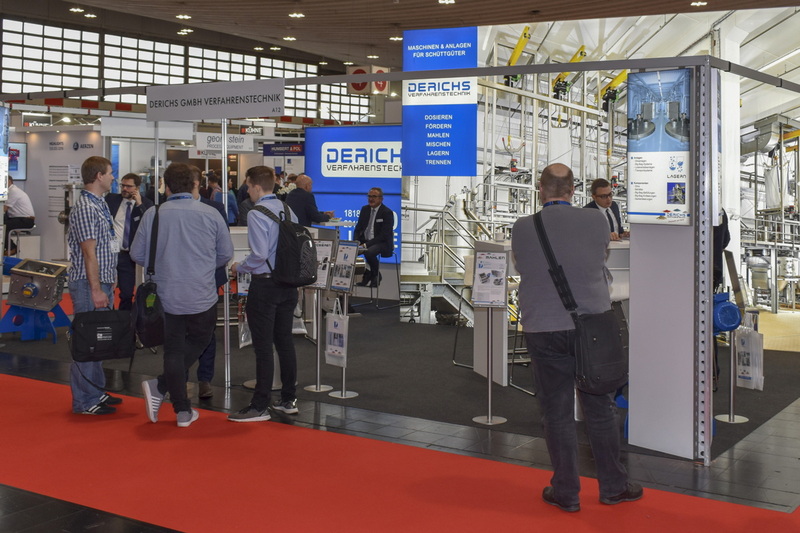 With offices in over 20 countries on all five continents, Schenck Process employs approximately 2,300 members of staff, more than 1,000 of whom are engineers. 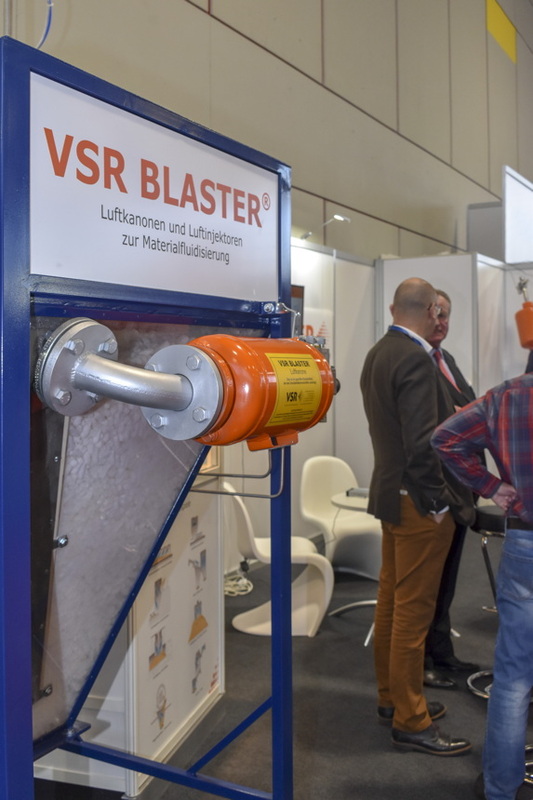 Solimar’s Fluidizer helps to discharge dry products like cement, flour, feed and lime. 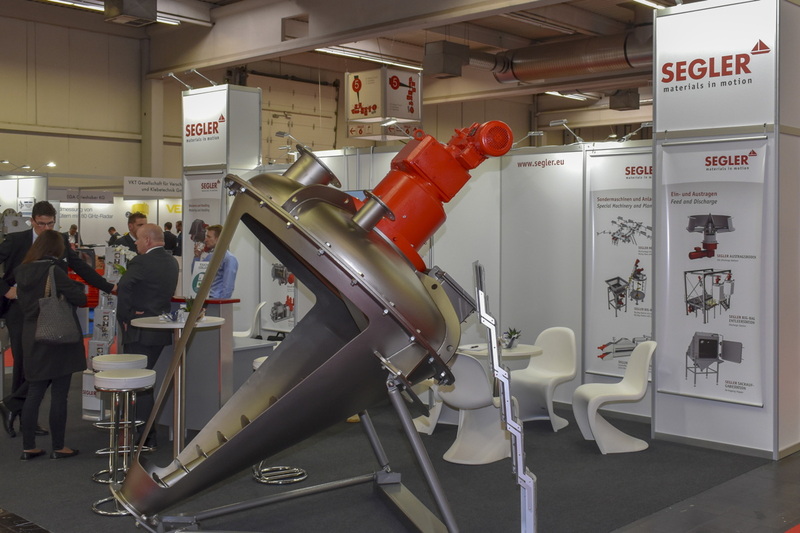 About Solimar Pneumatics: Solimar Pneumatics designs and supplies aeration devices and discharge aids for storage silos, hoppers, filters, bulk tank trailers and railroad cars. 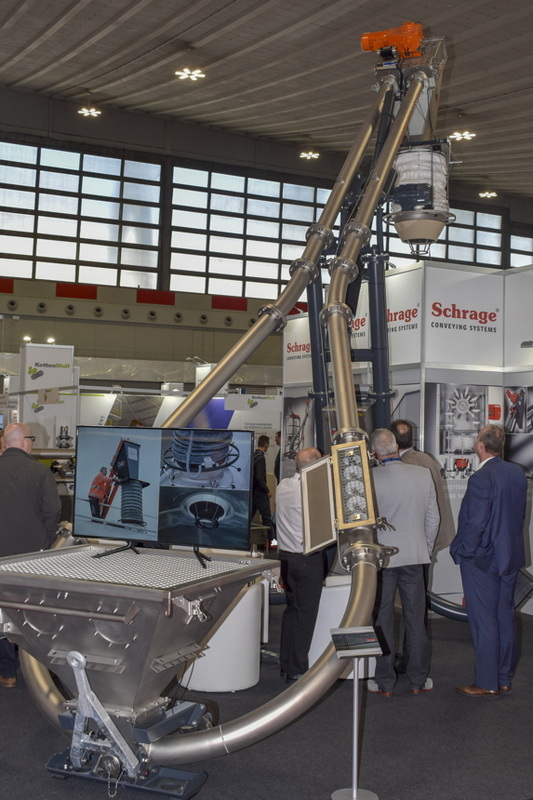 Solimar’s experience in the discharge of dry products has made it a recognized leader in the industry. 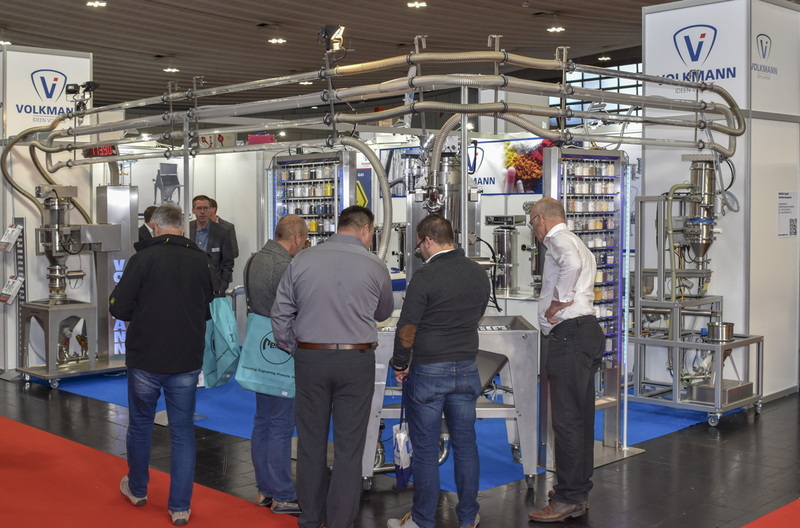 With a network of knowledgeable distributors, Solimar sells to over 65 countries worldwide. 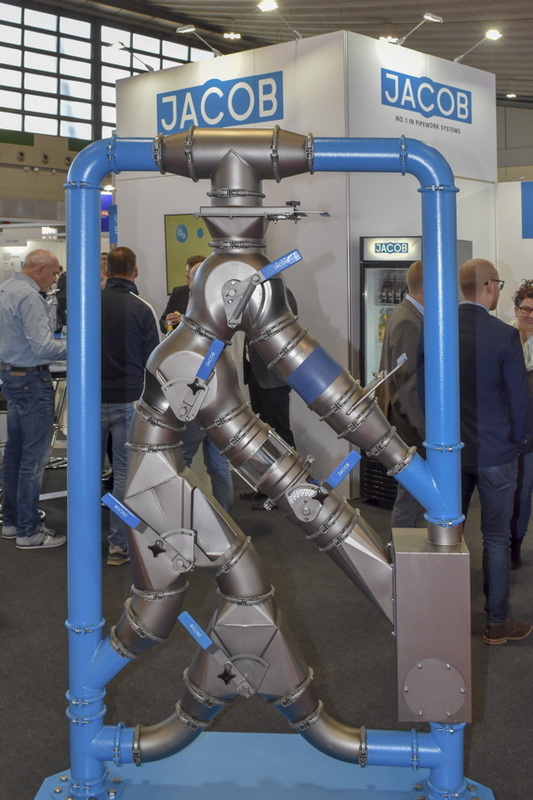 Tridelta Siperm offers, among other products, pneumatic aeration units made of highly porous SIPERM® materials for solving material flow problems in silos and other bulk containers. 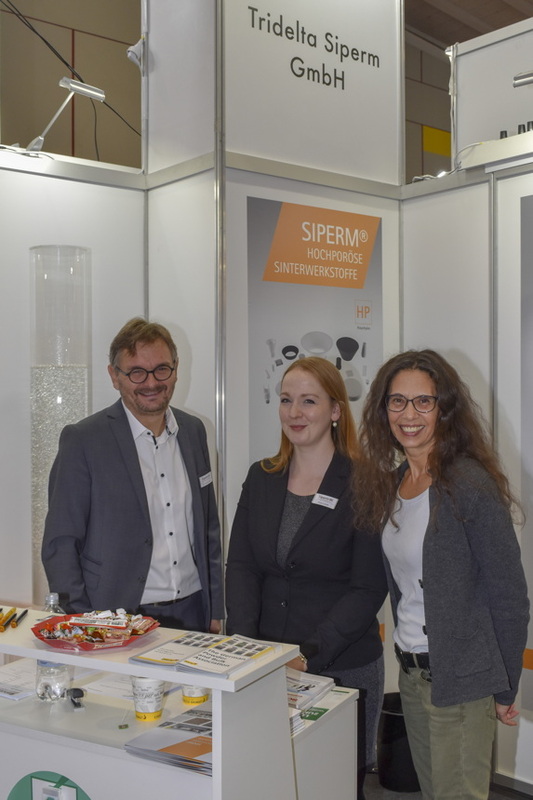 The Tridelta Siperm Team at Solids Dortmund 2018: Dipl.-Ing. 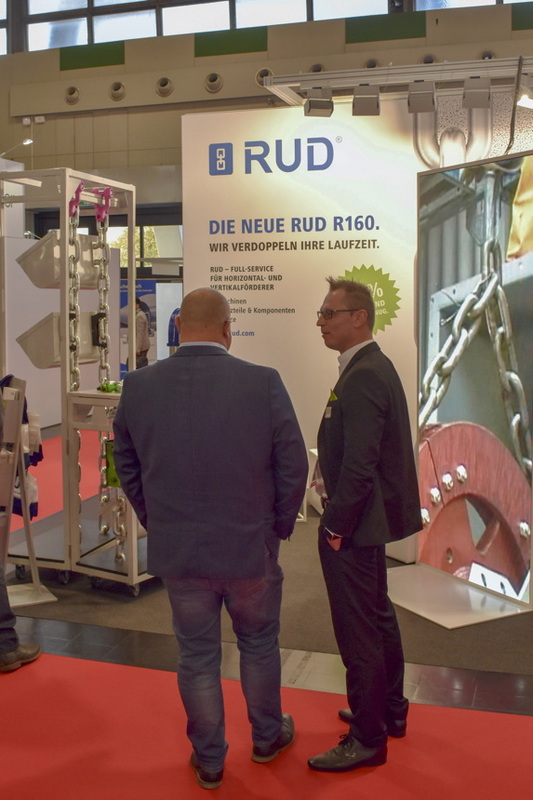 Markus Fricke, Managing Director, Kristina Wulff, Sales, and Helene Marshall, Sales & Marketing (FLTR). 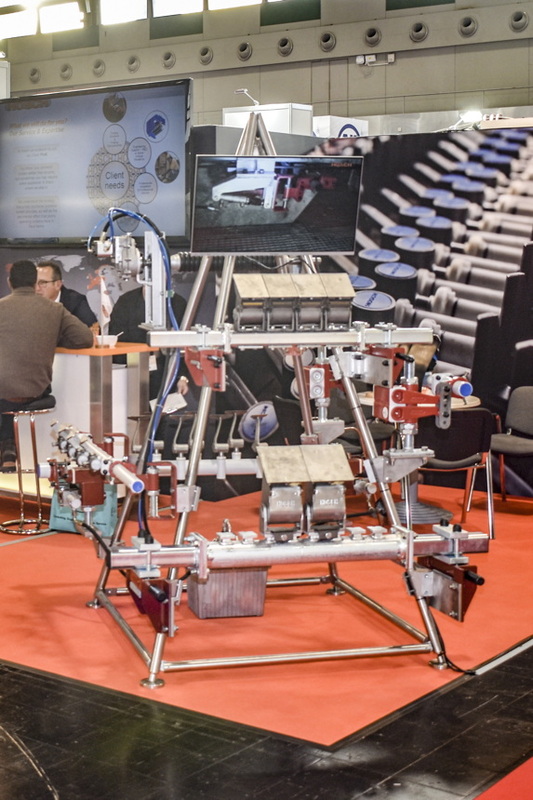 SIPERM® aeration-units are available in a variety of different designs: aeration-pads and spots, discs, pipes or funnels with standard or customized fixture. 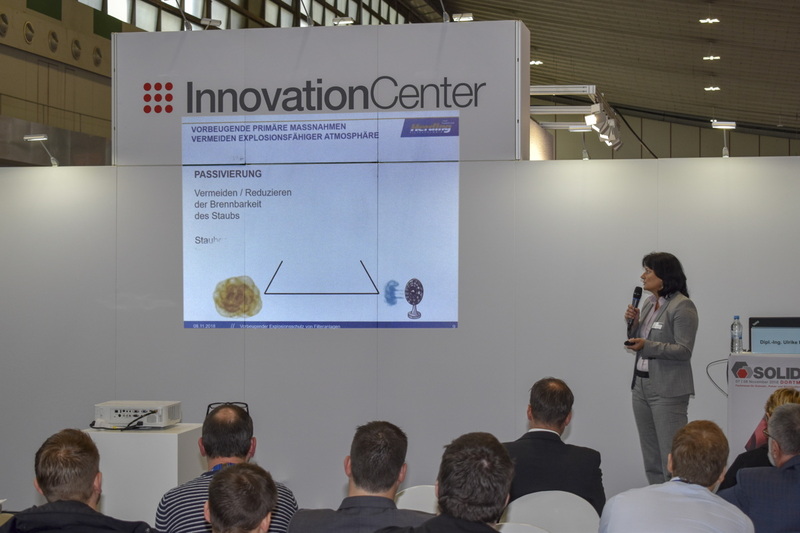 About Tridelta Siperm: Since 1953 Tridelta Siperm produces highly porous sintered materials at its site in Dortmund. 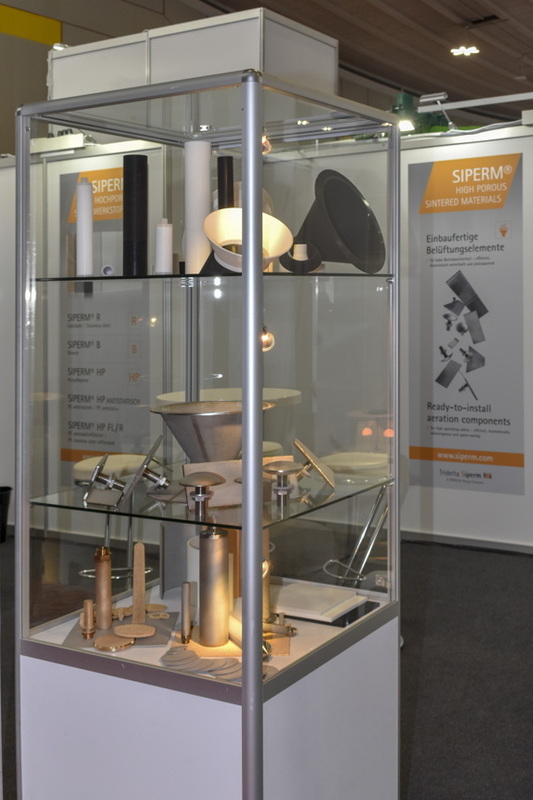 From its materials Siperm R, Siperm B, Siperm HP and Siperm HP antistatic Tridelta Siperm produces filter plates, filter cartridges, filter tubes, filter discs, molded parts, suction pipes, silencers, ready-to-install-discharge and loosening aids as well as aeration bottoms/fluidization bottoms in the form of welding constructions. 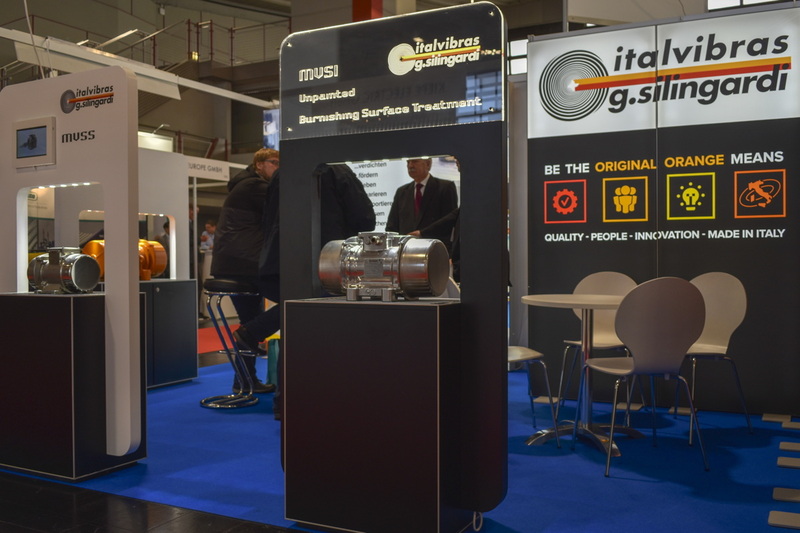 Generally, the company produces welding constructions according to customer drawings. 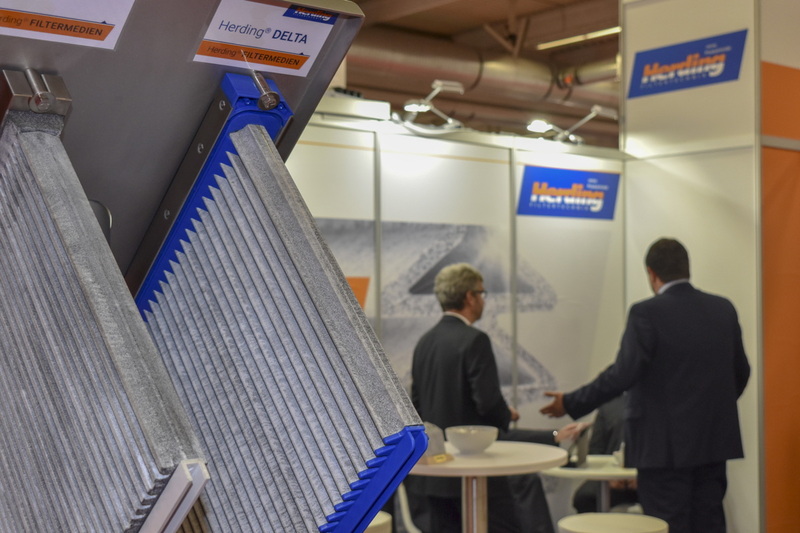 Highly porous sintered materials can inter alia be used for the following applications: fluidization and discharge, homogenization, aeration and de-aeration, extraction, compaction of bulk material, volume reduction, cooling and drying, forming, inertisation, filtration, silencing, safety technology, explosion protection and storage of liquids. 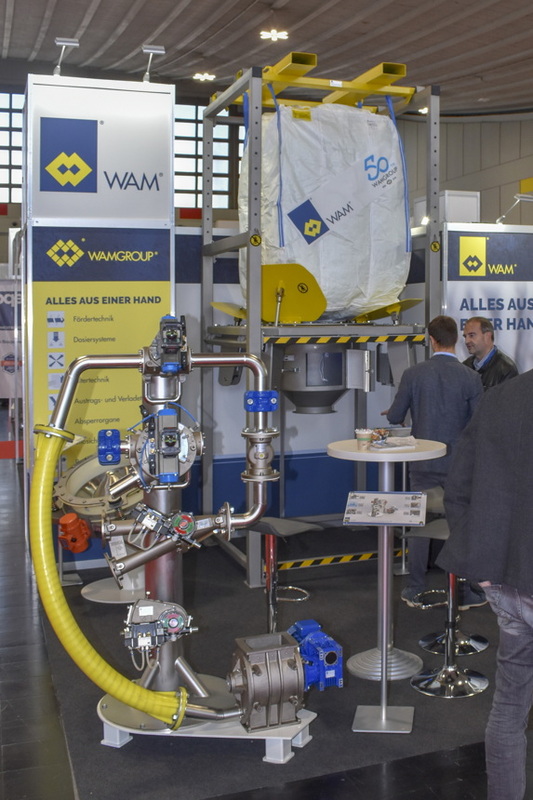 WAMGROUP is a global leader in screw conveyors and holds top-ranking positions in each of its product lines in the field of bulk solids handling and processing. 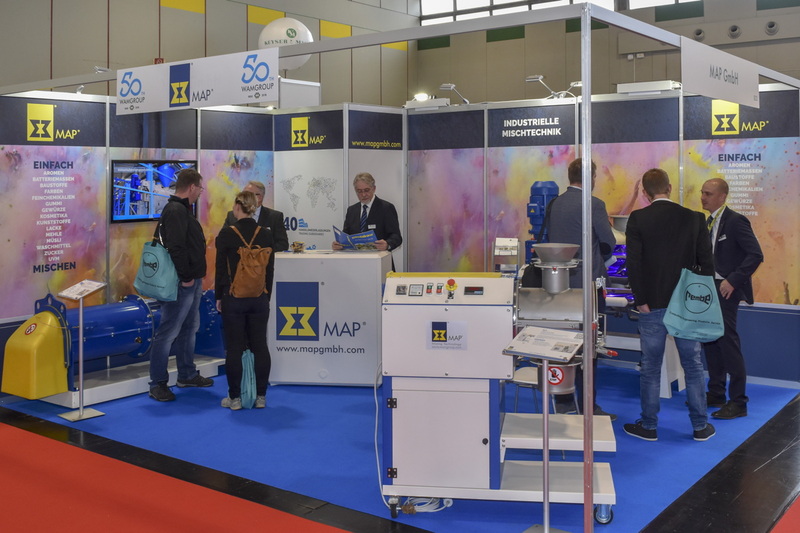 WAMGROUP’s MAP brand stands for mixing technology applied in a variety of industries and applications. 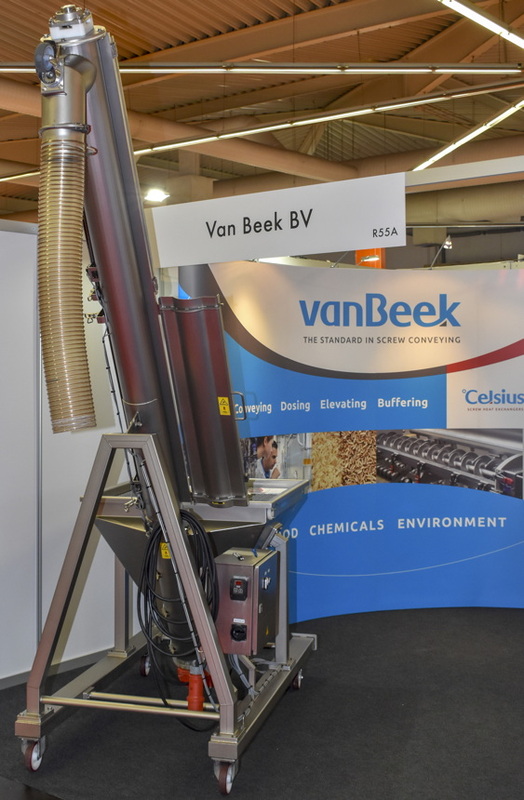 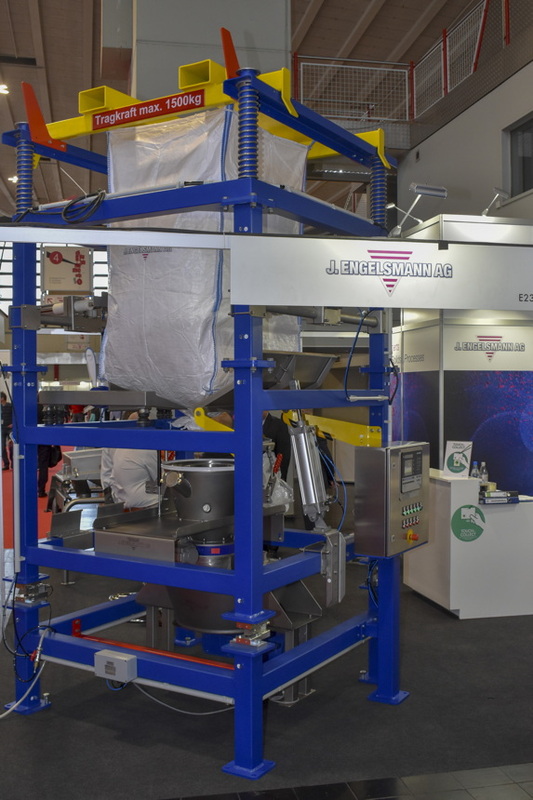 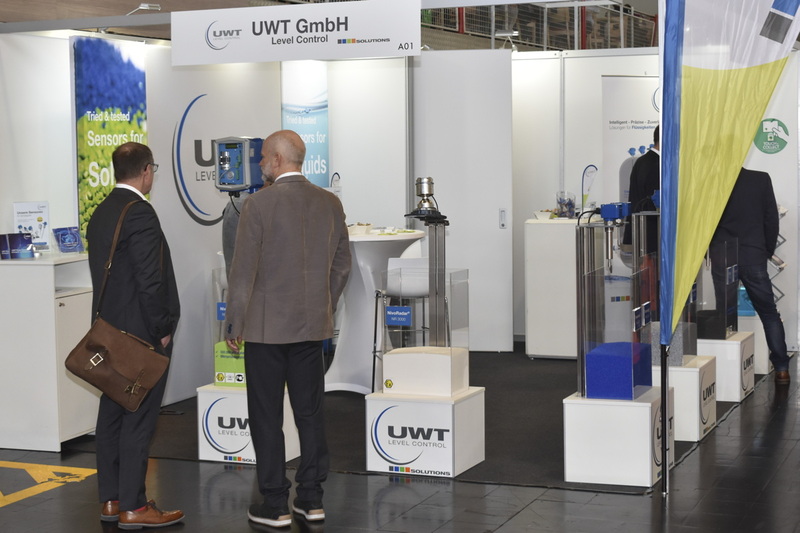 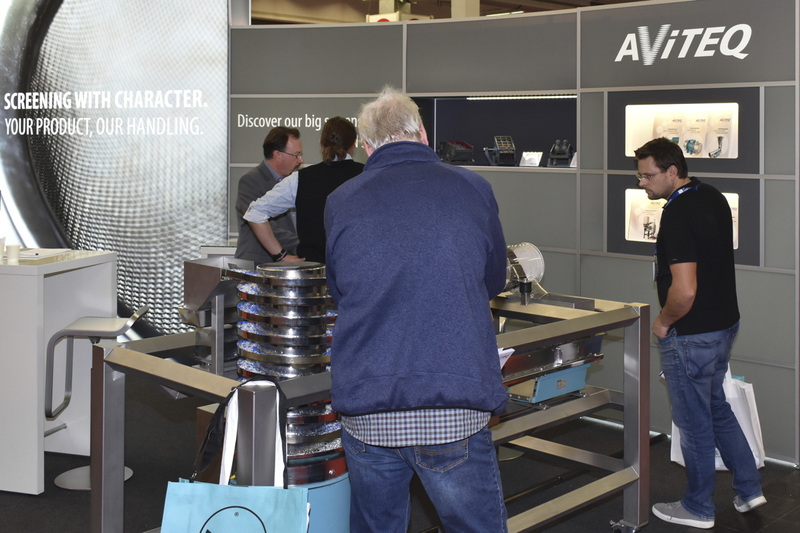 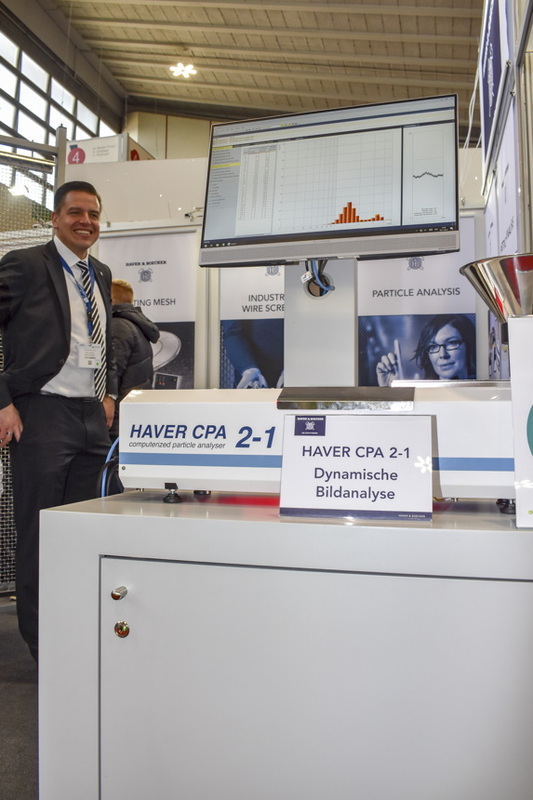 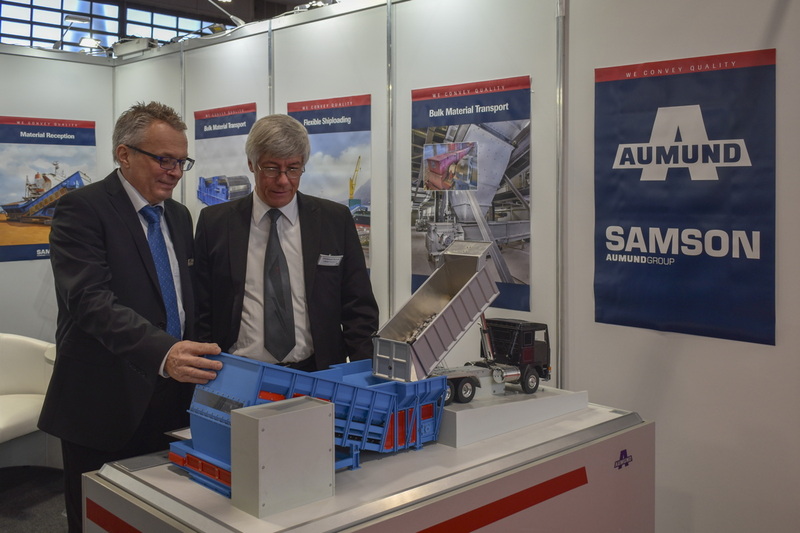 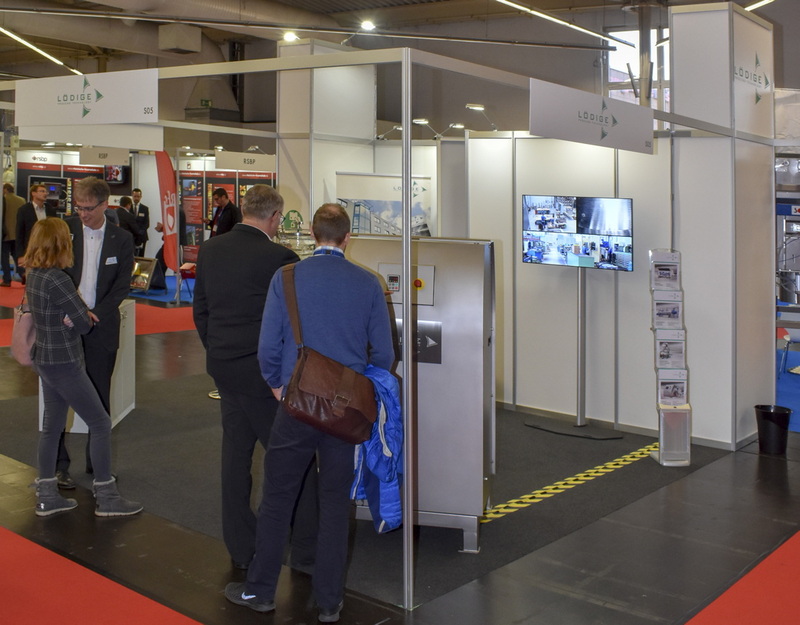 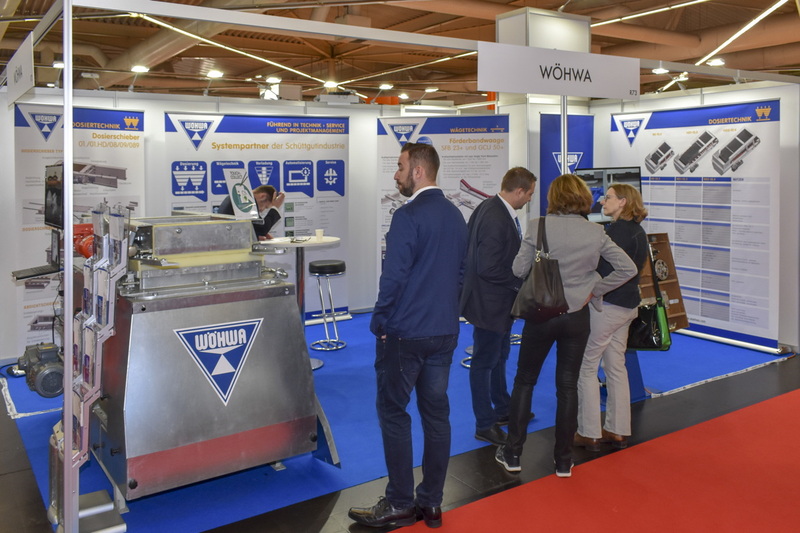 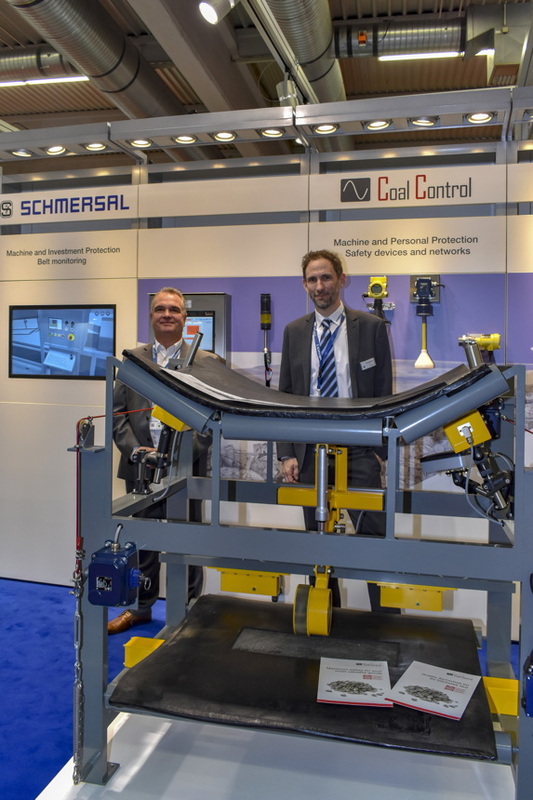 At Solids Dortmund 2018 the WAMGROUP presented the Big Bag Emptying Station SBB, whose new design makes safe and efficient handling and emptying of Big Bags even easier. 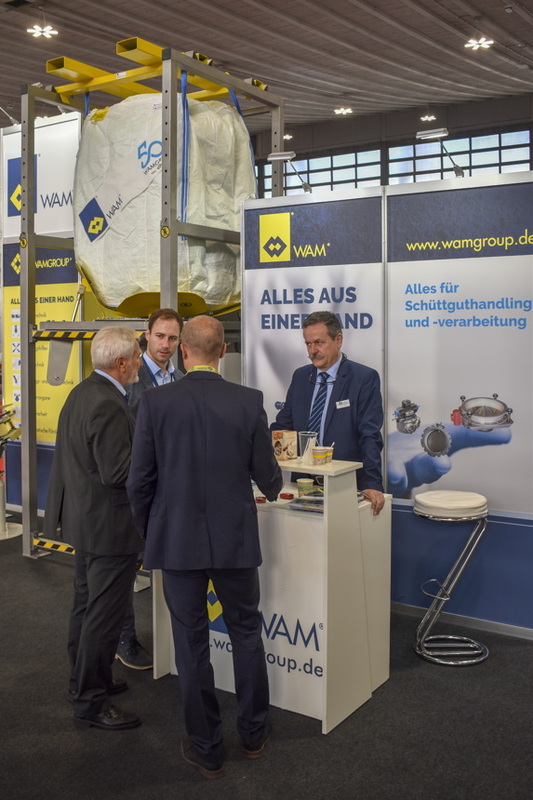 In 2018, the WAMGROUP is celebrating its 50th anniversary since its foundation in 1968. 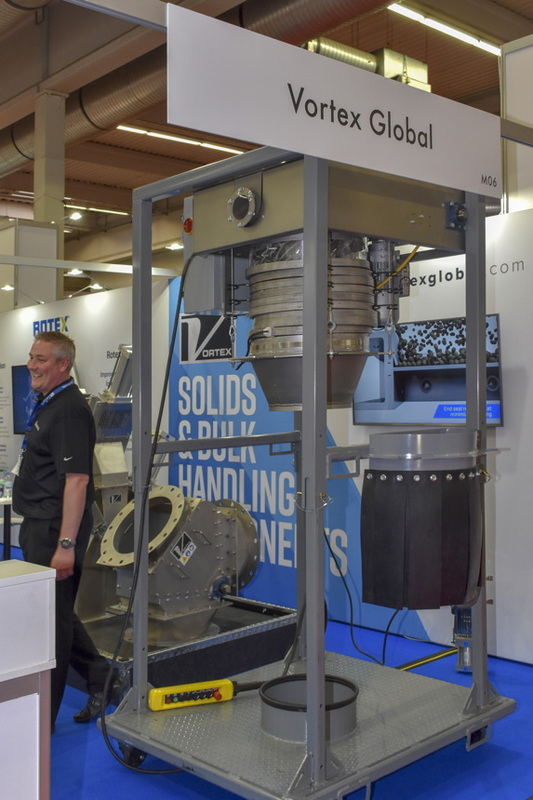 About WAMGROUP: Since 1969 WAMGROUP has been designing, engineering and manufacturing equipment for bulk solids discharging, conveying, dosing, mixing solids with solids and solids with liquids, for dust filtration, and for solids-liquid separation. 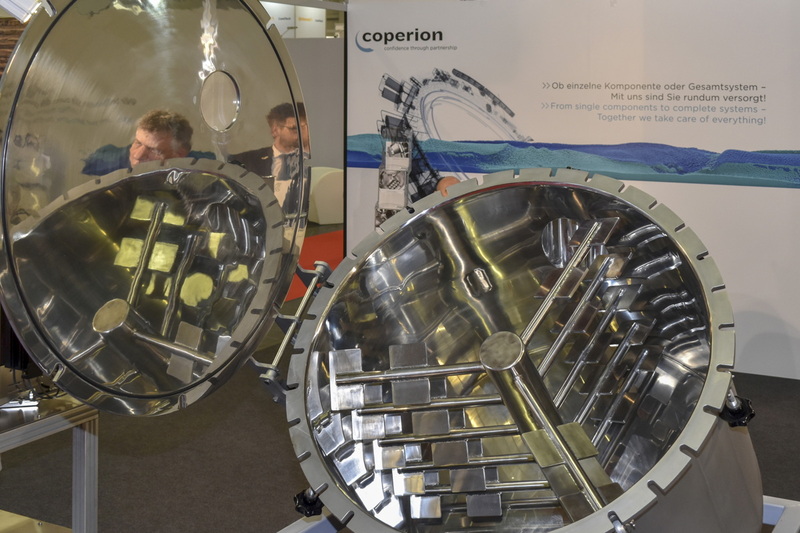 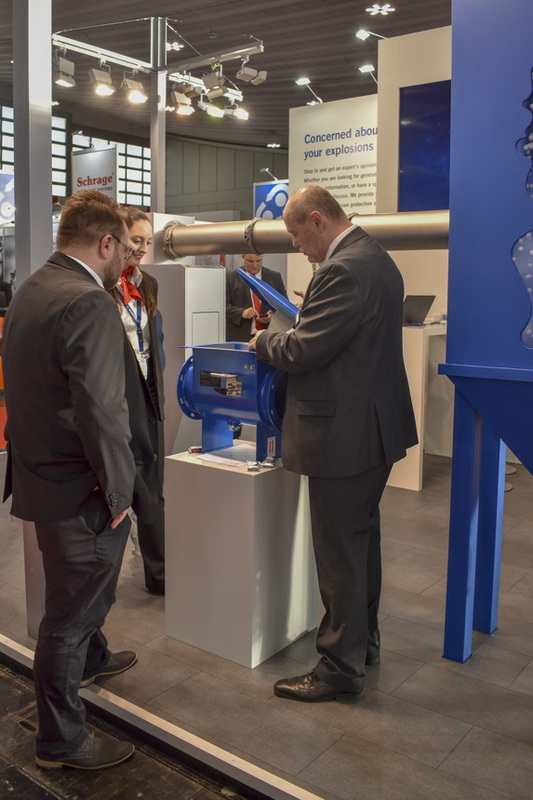 This has led to the most comprehensive product range available on the market today and has made WAMGROUP a world leader in the supply of components for dry solids storage, handling and processing plants. 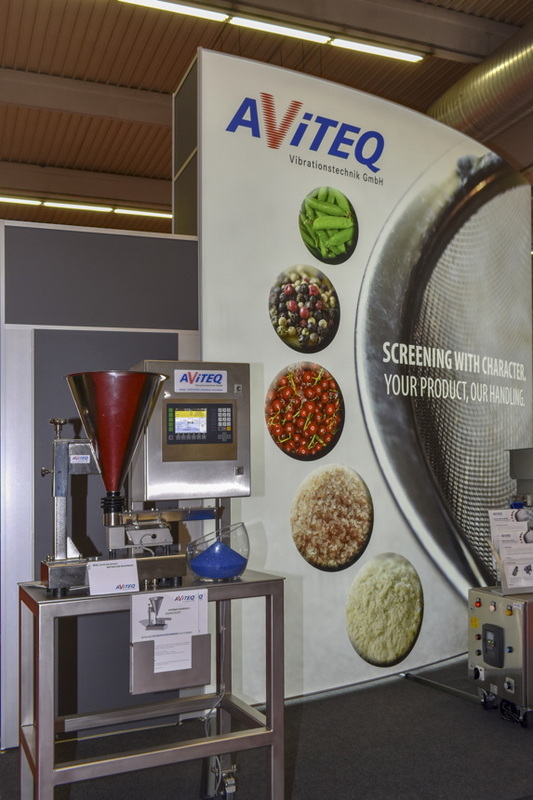 Production is divided into Manufacturing Divisions who pride themselves on great expertise and know-how in such technologies as: Dust filtration, silo safety, material flow control, feeding and discharging of powders and granular materials, mechanical and pneumatic conveying of powders and granular materials from horizontal to vertical, mixing, blending, conditioning and granulating, handling and treatment of sludge and other viscous or adhesive materials, as well as solids-liquid separation. 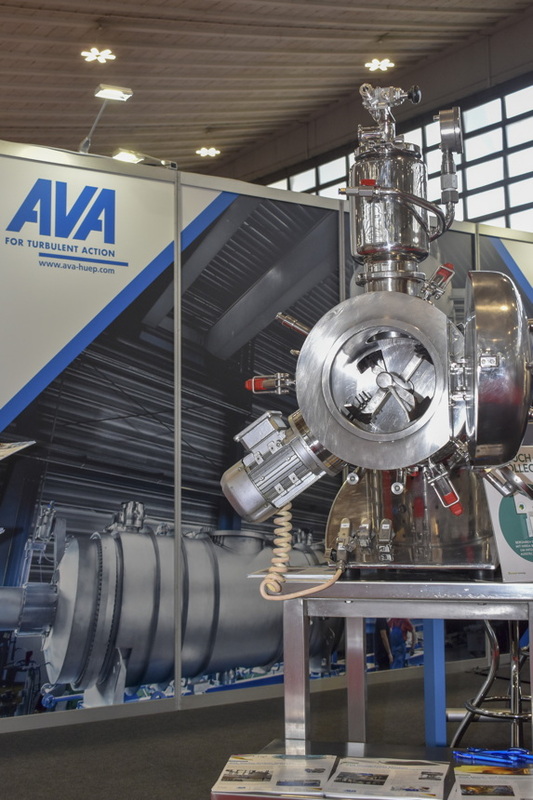 AKO’s valves and fittings are specially designed for isolating and regulating abrasive, fibrous and corrosive media. 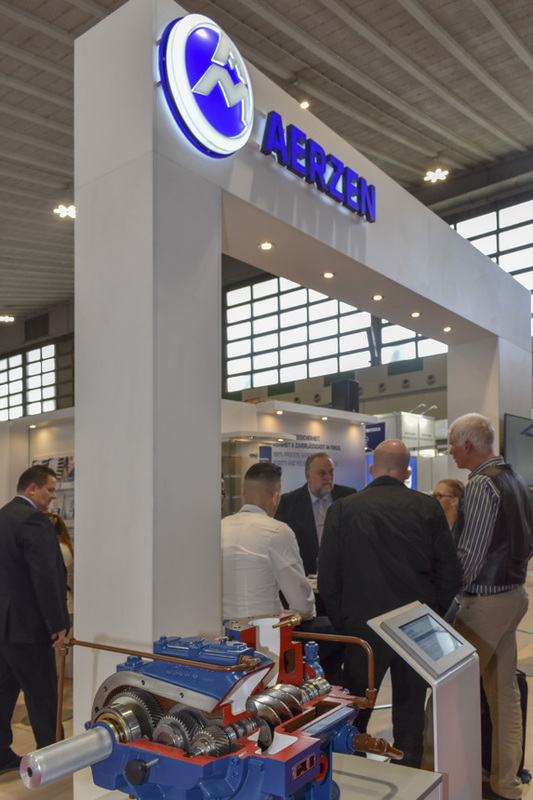 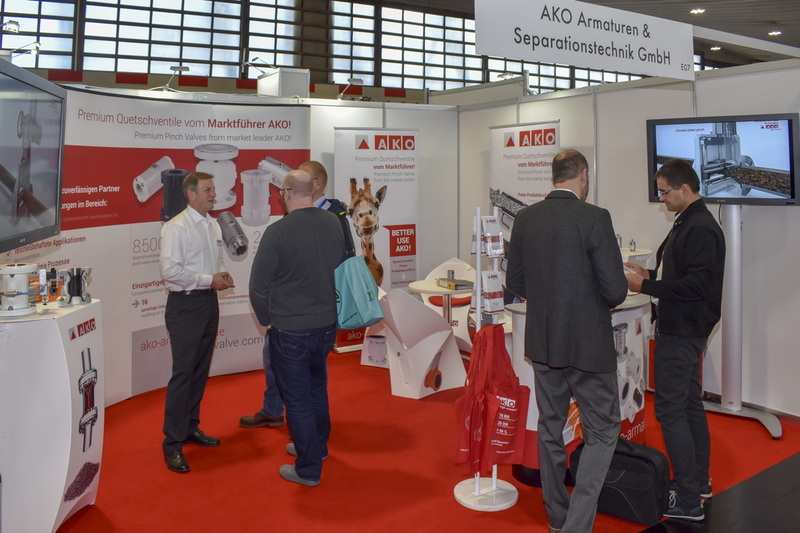 About AKO Armaturen & Separationstechnik: AKO Armaturen & Separationstechnik GmbH is the global market leader for air operated Pinch Valves. 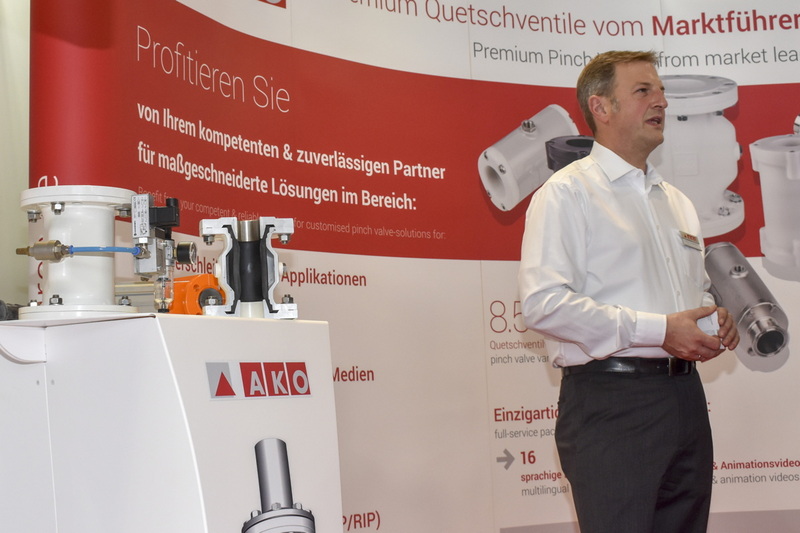 AKO is a family-run company, which has been manufacturing reliable, cost-effective and innovative Pinch Valves for more then 30 years. 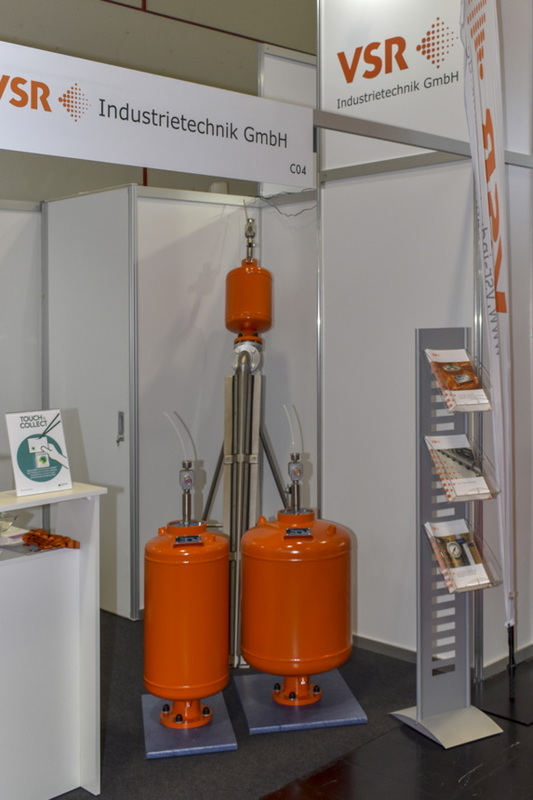 In addition, AKO’s product portfolio includes a wide range of different mechanical pinch valve series, knife gate valves, pipe manometer, pressure relief valves, sleeves for pinch valves and pinch valve or knife gate valve accessories. 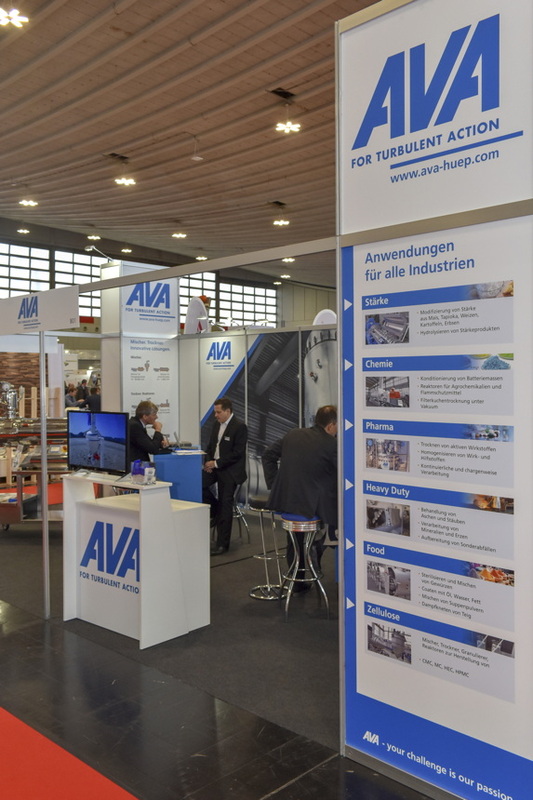 AKO works with various companies from the widest variety of sectors all around the world. 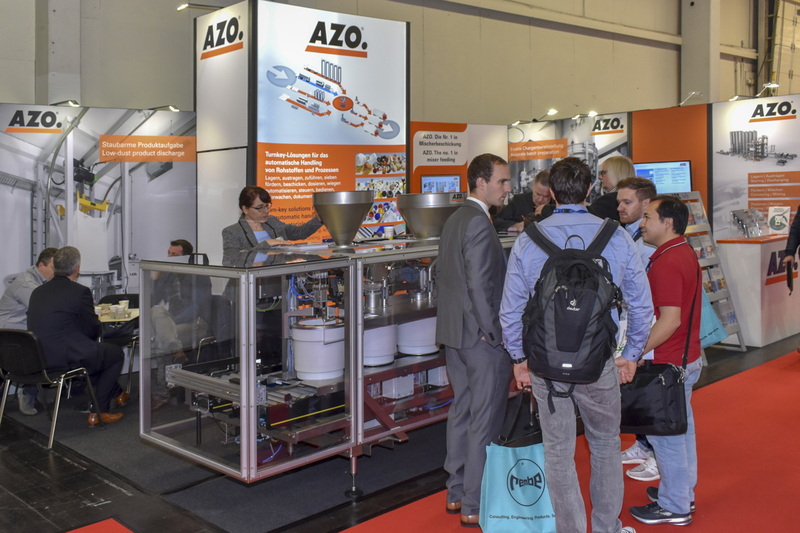 The customers of AKO come from industrial sectors such as chemicals, foodstuffs, paper, power plant and recycling technology, waste water treatment and in particular in the minerals handling, cement, sand and silo engineering sectors. 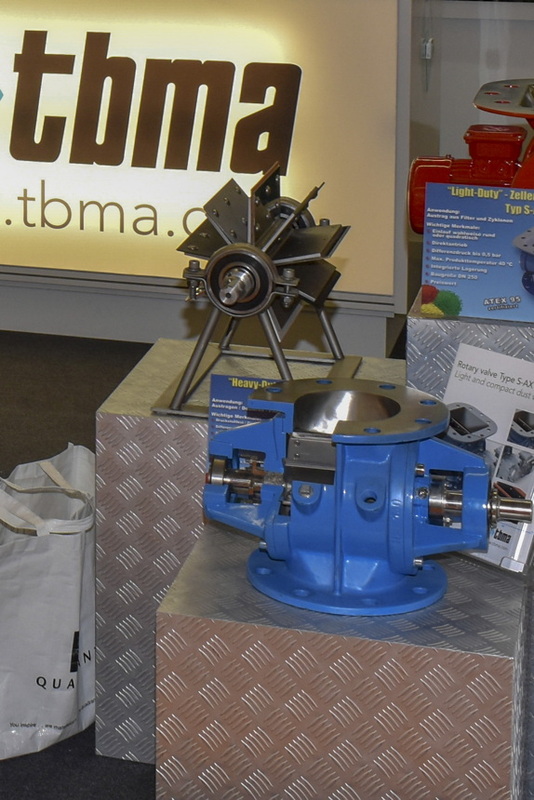 DMN design and manufacture rotary valves and diverter valves for the bulk solids handling industry. 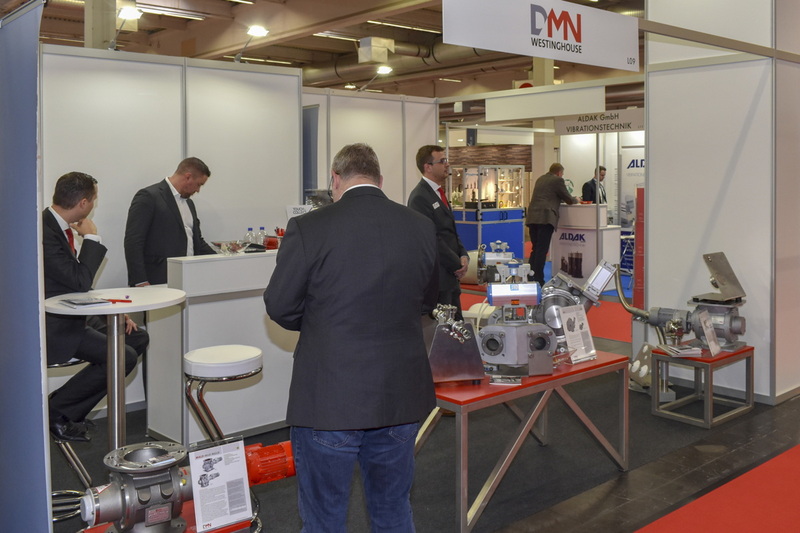 Besides these valves, DMN also supply complementary components, such as the original Morris pipe couplings, slide valves and pressure relief valves. 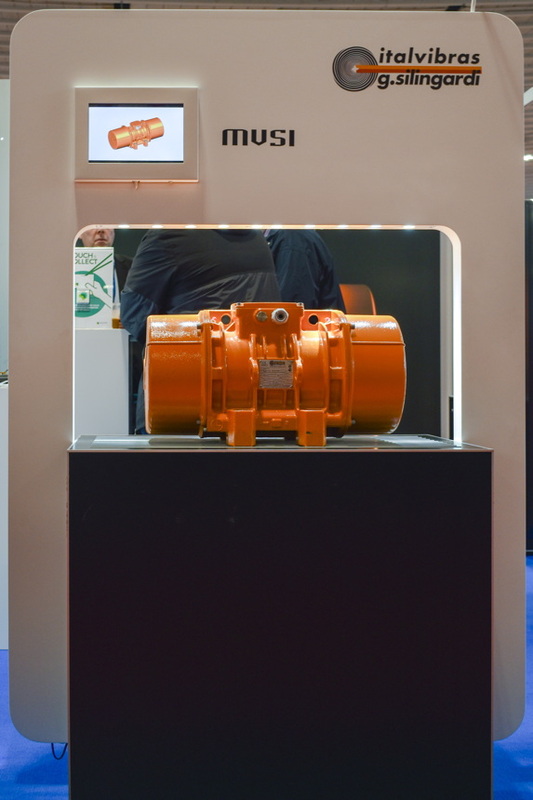 The HP rotary valves have been designed by DMN-WESTINGHOUSE for applications in the metering and pneumatic conveying of granular products under a high pressure of maximum 3.5 bar g.
About DMN-WESTINGHOUSE: The international world of processing comprises a large variety of industries and companies. 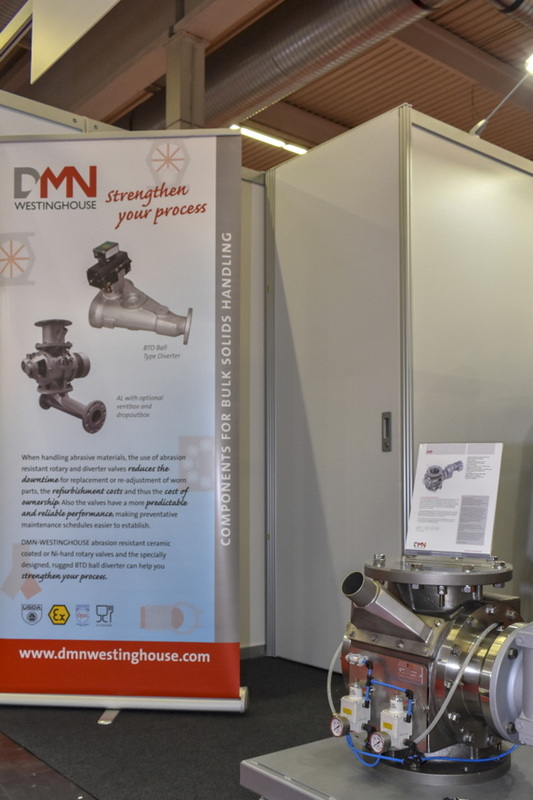 DMN-WESTINGHOUSE has been supplying rotary valves and diverter valves to the bulk solids handling industry for more than 45 years. 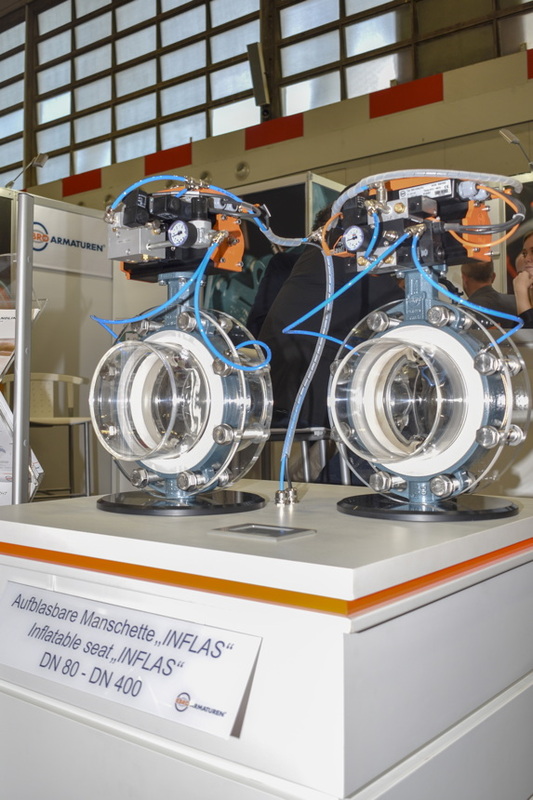 As an independent company with no involvement in system design, its sole activity is the development, manufacture and sale of these components. 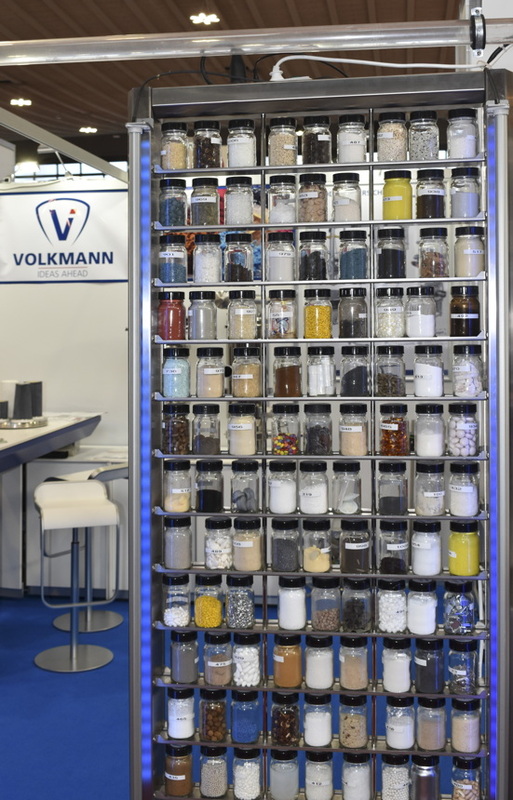 Selecting the right components is critical to the success of any dry bulk material handling system. 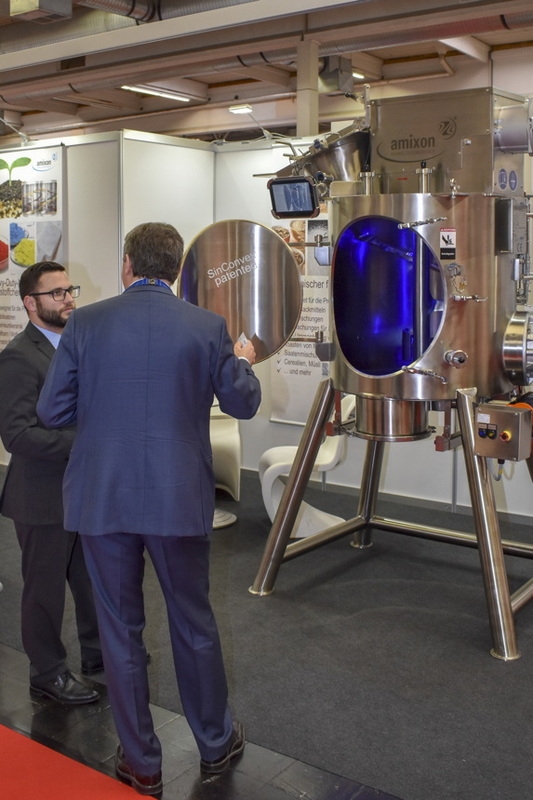 DMN-WESTINGHOUSE offers tailor-made solutions to the global food, dairy, pet food, plastics, (petro)chemical, pharmaceutical, mineral, power and biomass industries. 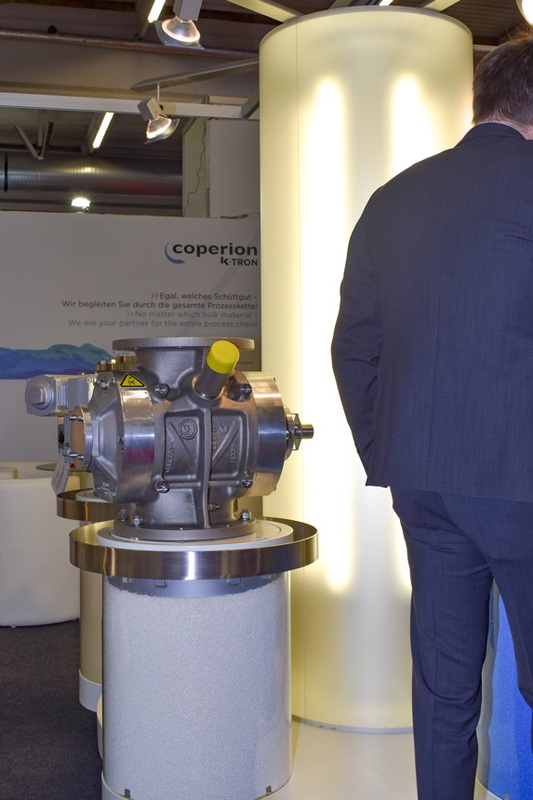 The company’s line of rotary valves and diverter valves comprises a number of universal components that are suitable for many applications. 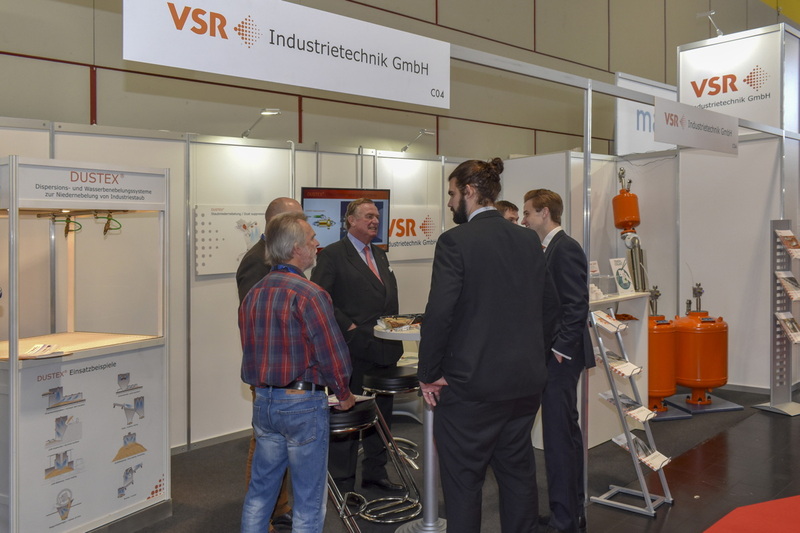 The company also has a range of dedicated components for use in specific industries of to handle specific products. 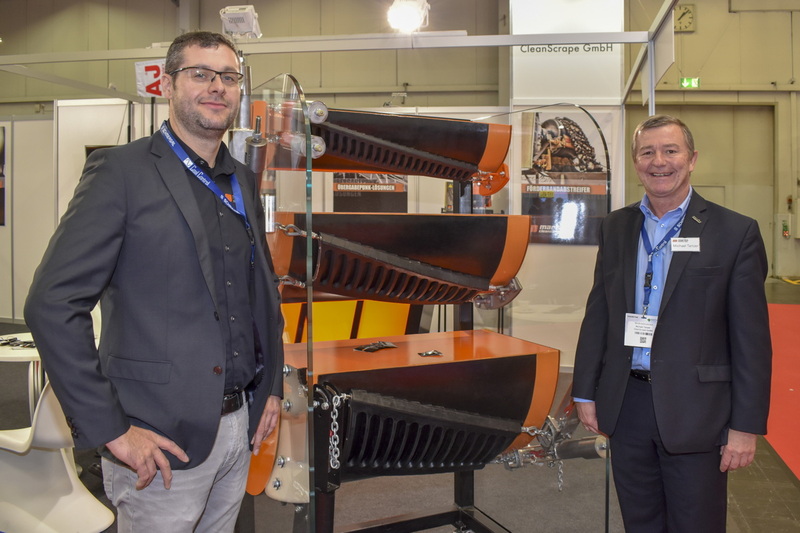 Julius Wagner, Heavy-duty Field Specialist and Dieter Maurer, Area Sales Manager, both from Flexco Europe GmbH, present the Flexco range of belt conveyor accessories. 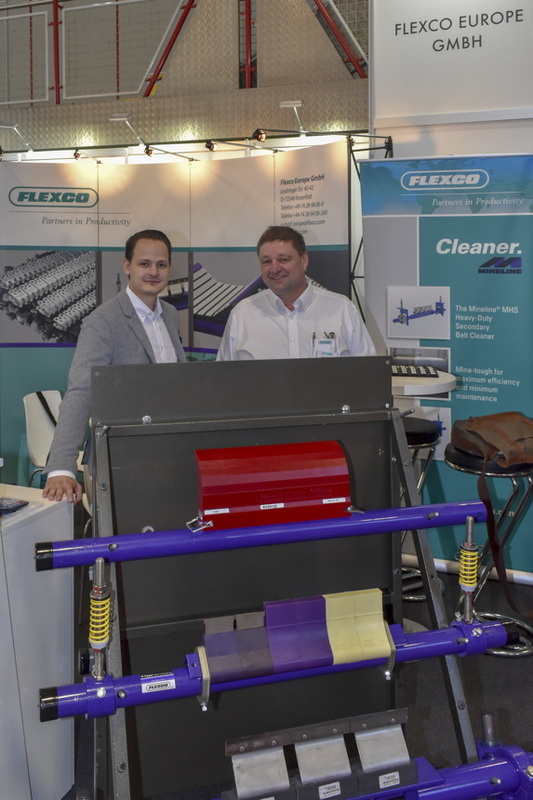 About Flexco Europe GmbH: Flexco Europe GmbH, headquartered in Rosenfeld, Germany is a leading international provider of mechanical conveyor belt fastening systems, innovative belt cleaners, belt positioners, impact beds and pulley lagging for light- and heavy-duty applications. 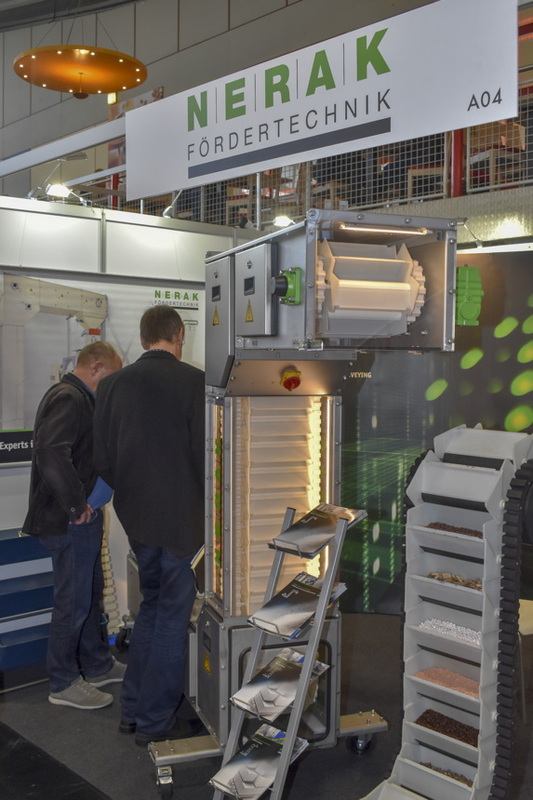 These products are used in widely different industries – mining, steel, wood and food processing, package and luggage transport, assembly, laundries, warehouses, cash registers, and agricultural equipment. 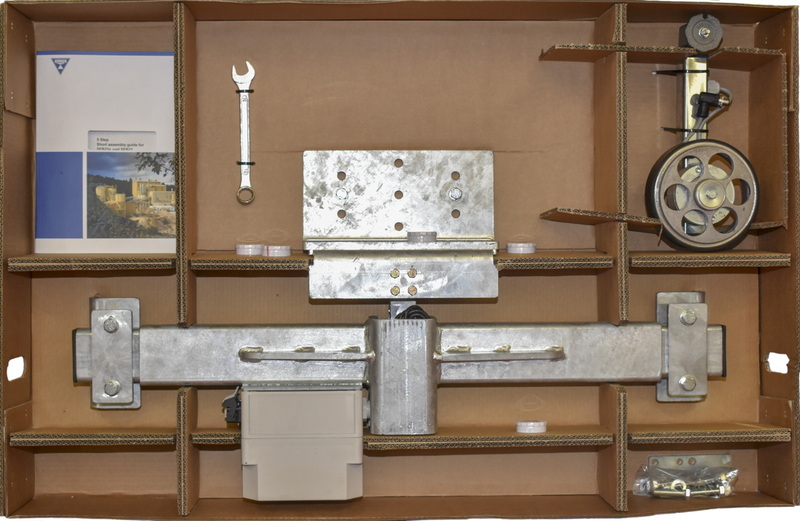 The innovative products increase system service life and reduce maintenance costs. 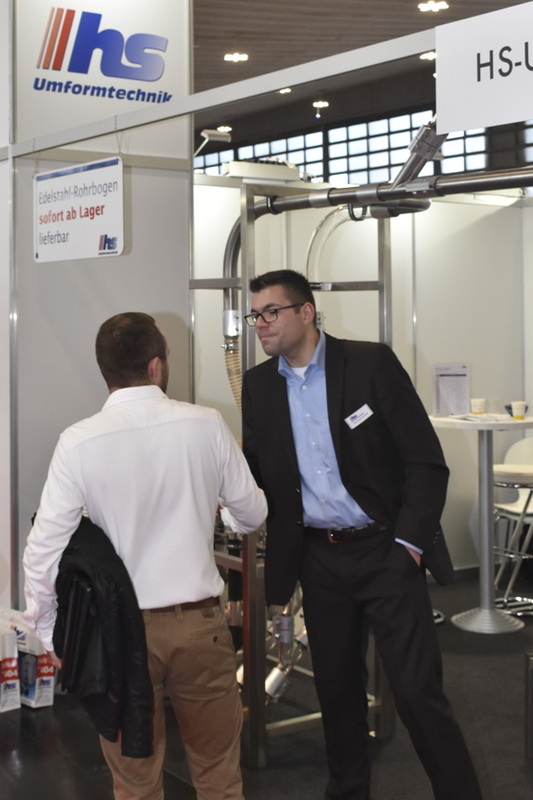 With Flexco´s competent consultation and support, users always operate their systems at high level of productivity. 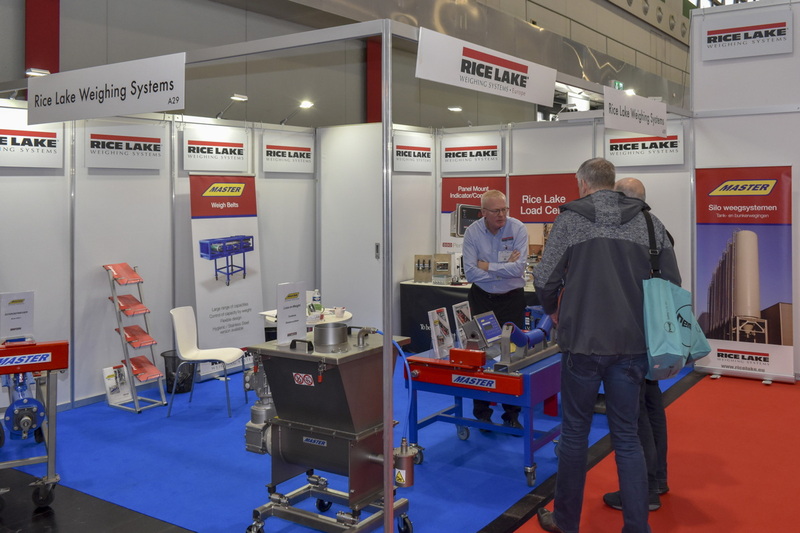 Lödige offers high-quality subsystems and services for process applications in all industrial fields of mixing, granulation, coating, drying,reaction and the related processes. 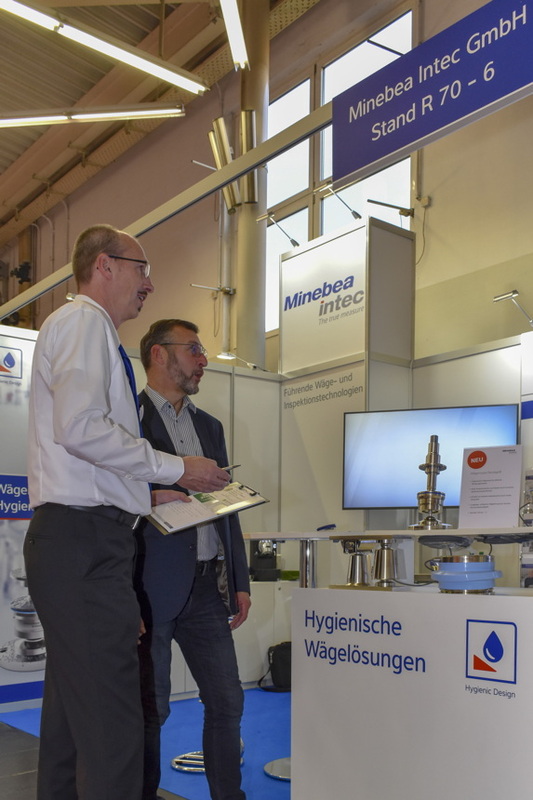 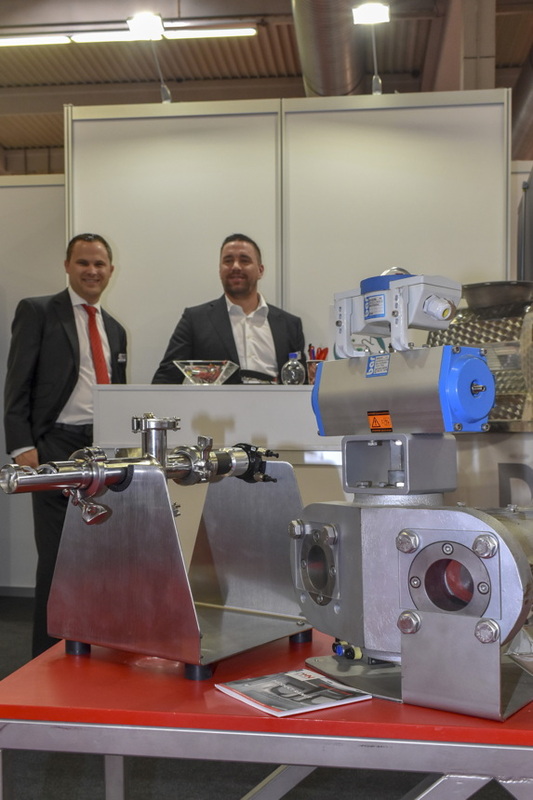 Dr. Dirk Jacobs and Thomas Wegener, both Sales Mixing and Reacting Technologies at Lödige. 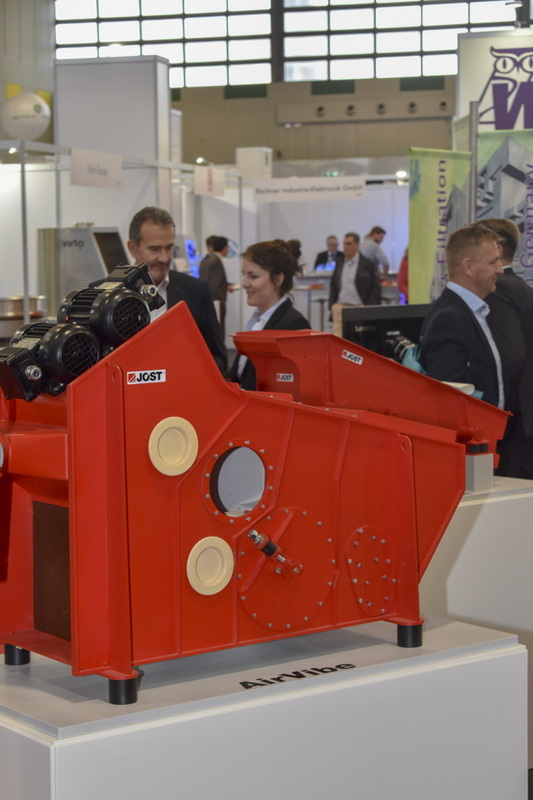 About Gebrüder Lödige Maschinenbau: Gebrüder Lödige Maschinenbau GmbH, inventor of the Ploughshare® Mixer, is a worldwide leading manufacturer of machines and subsystems for industrial mixing and related process technologies for bulk solids, granulates, powders, dust, paste and sludge. 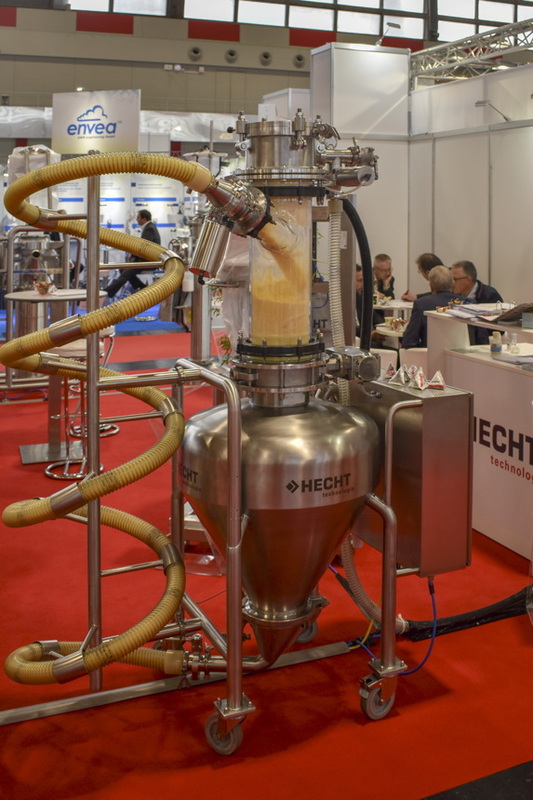 Mixing, granulation, emulsification, coating, drying and reacting – all the applications in the field of industrial mixing and related process engineering technologies are the company’s business. 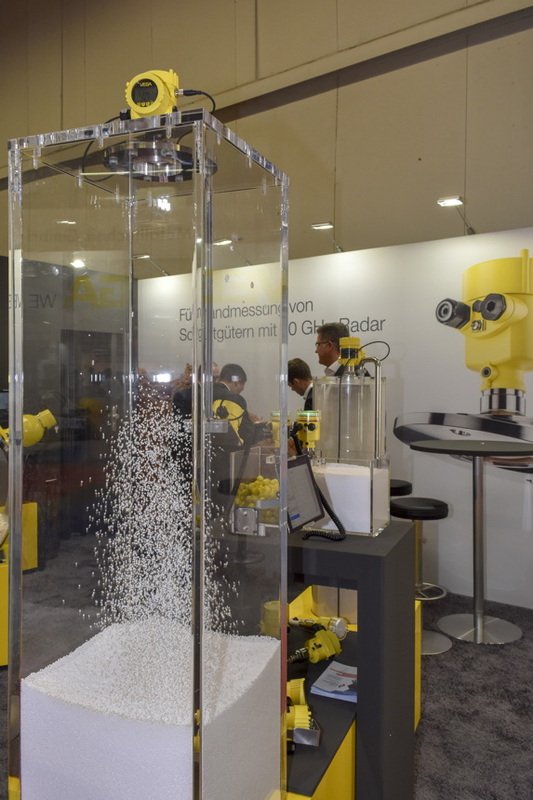 Thereby, Gebrüder Lödige Maschinenbau is predominantly concerned with the handling of bulk materials, granulates, powders, pastes, emulsions, dusts and sludges. 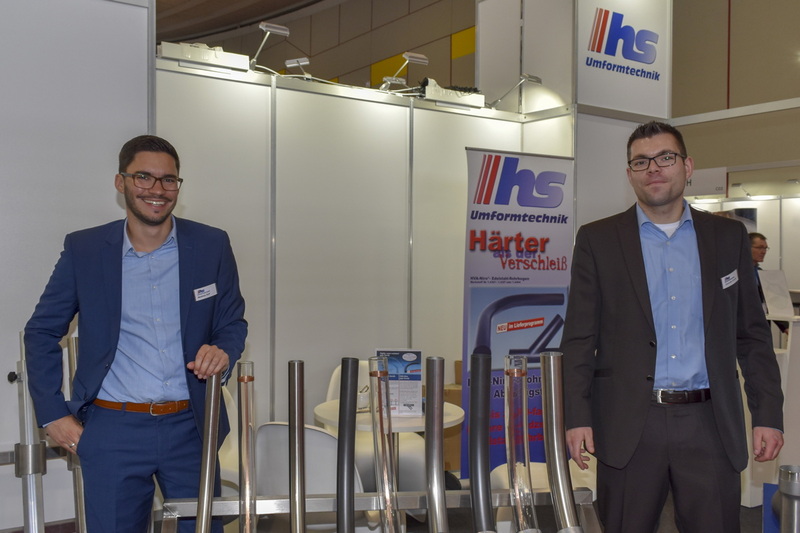 The high availability of tubes in all common sizes and diameters as well as fast delivery make hs-Umformtechnik a reliable partner for its customers. 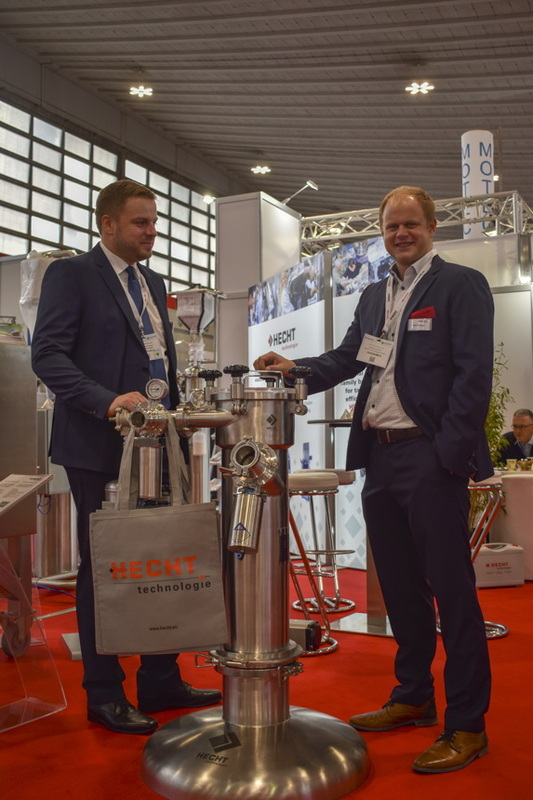 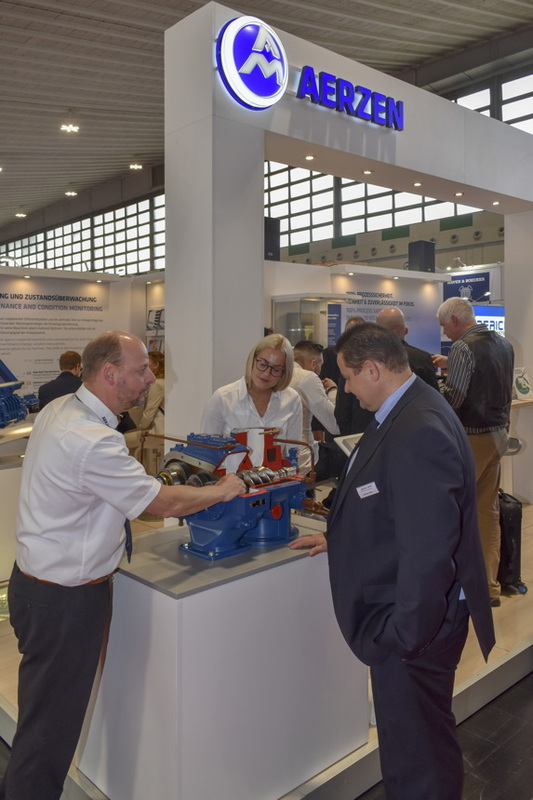 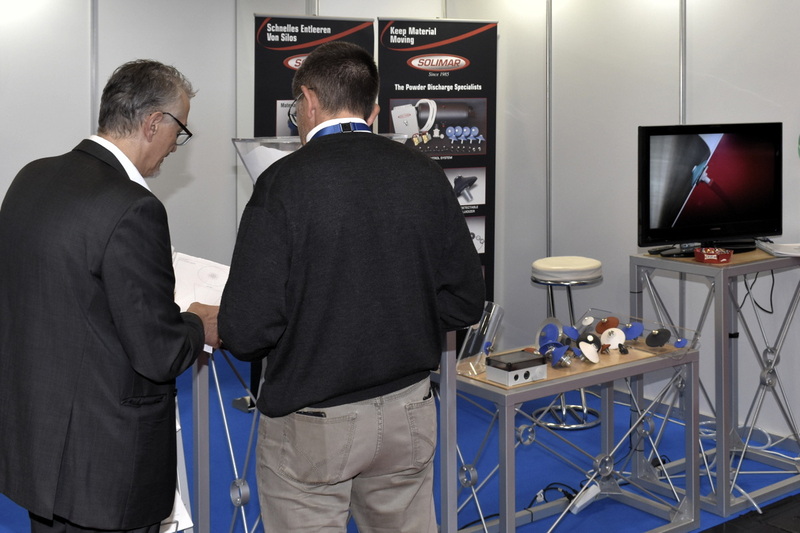 Matthias Ruff and Alexander Schmitt presented an excerpt from the extensive product range of hs-Umformtechnik. 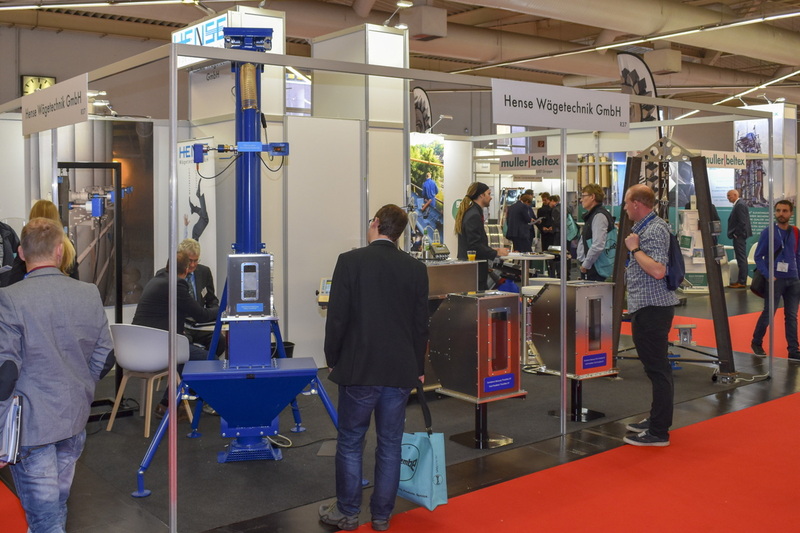 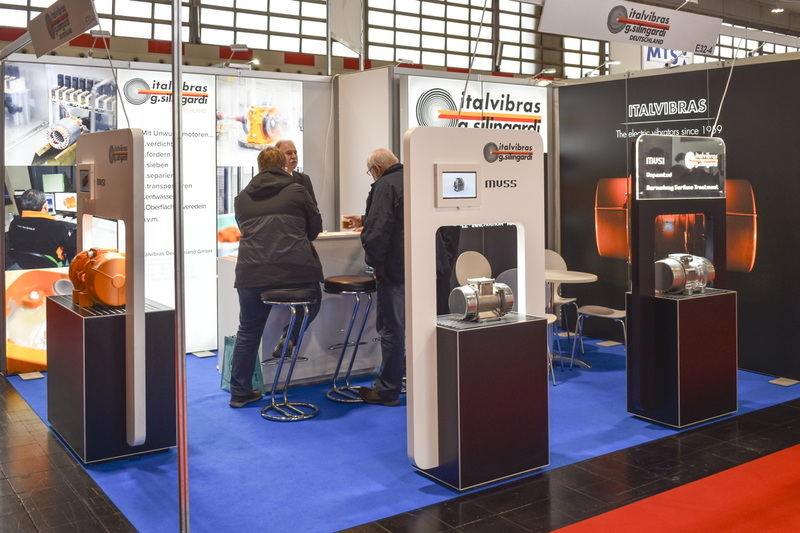 About hs-Umformtechnik: hs-Umformtechnik GmbH is a medium-sized family-run company which was established in 1997 and since that time has continuously expanded. 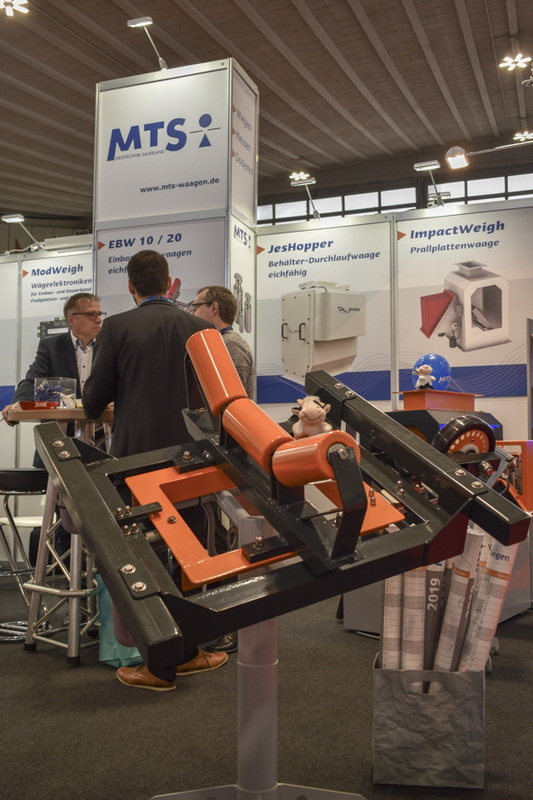 Especially the quick delivery readiness had made hs-Umformtechnik a worldwide system supplier for pneumatic conveyor system builders in the plastic, food and chemical sectors. 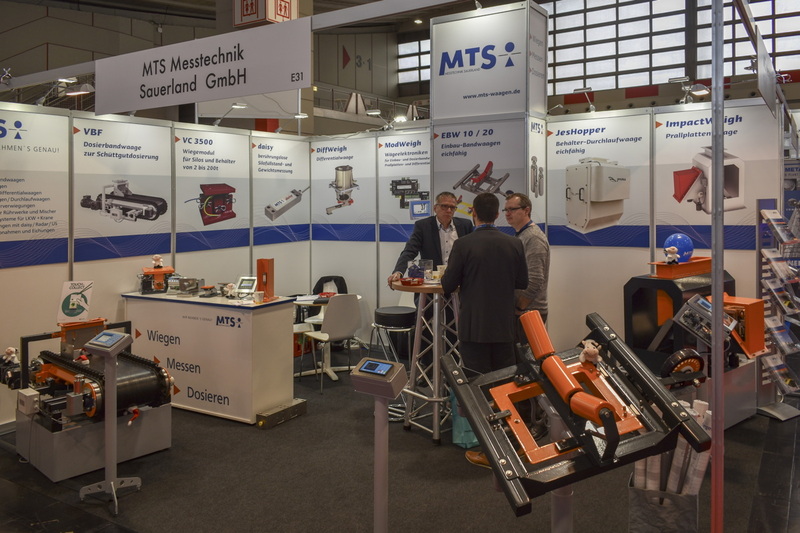 The company’s name hs-Umformtechnik is representative for the company’s claim to the highest standards in forming technology. 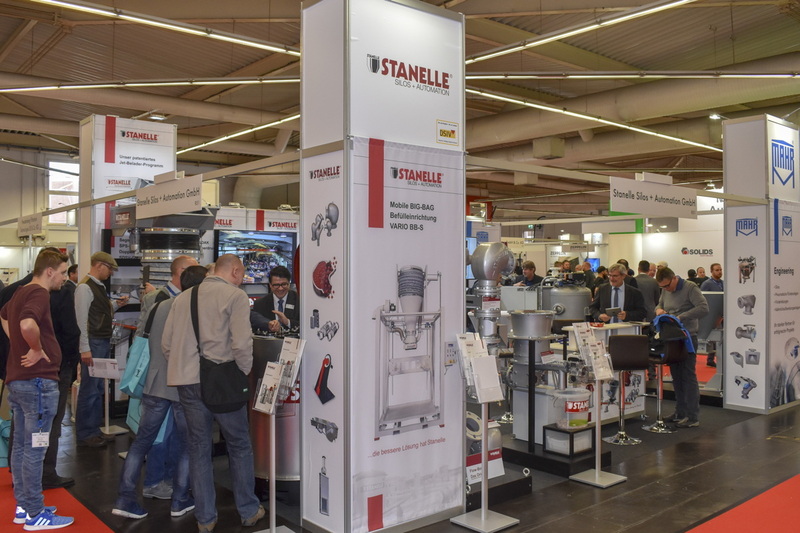 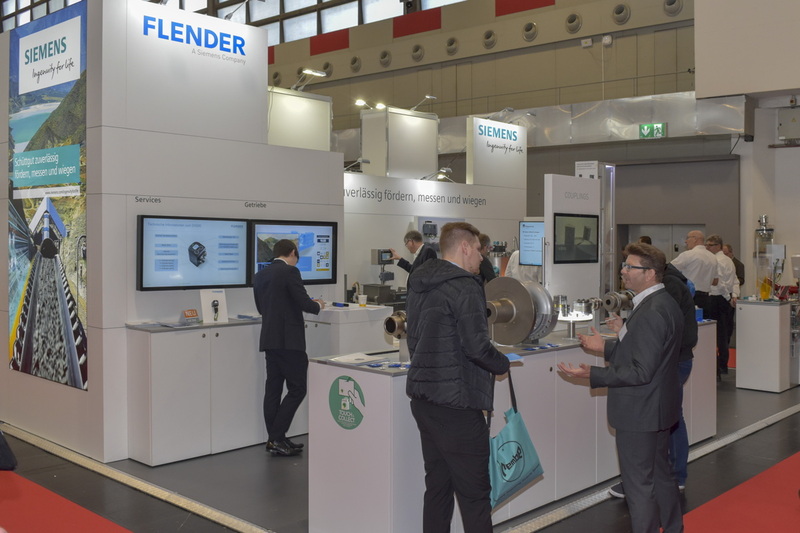 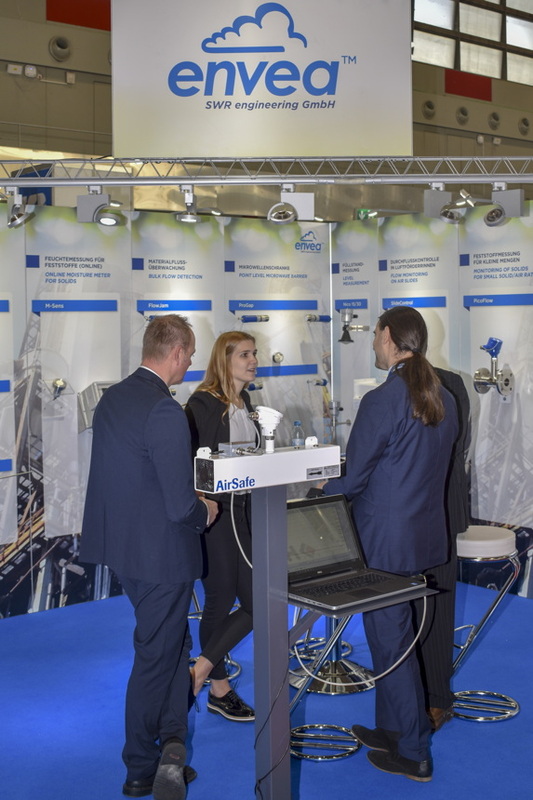 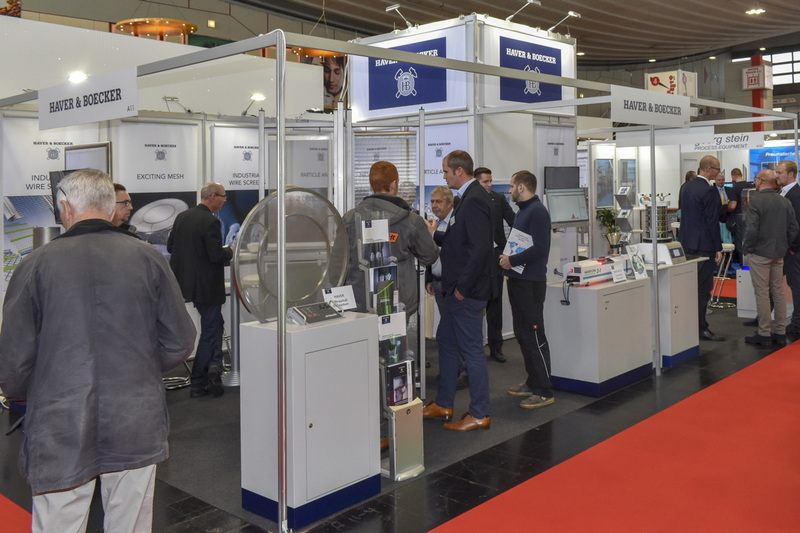 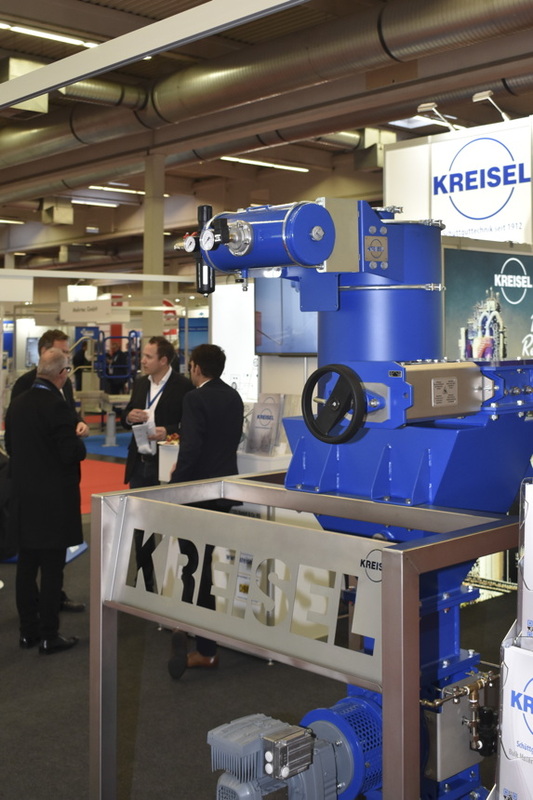 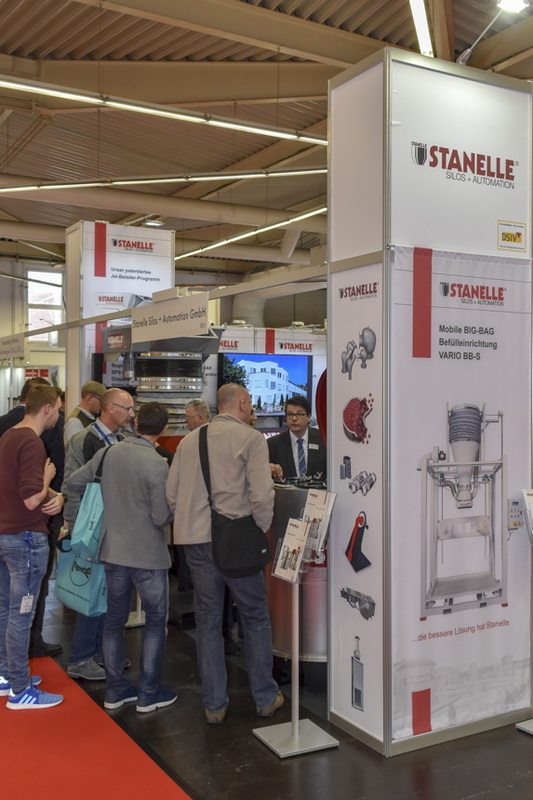 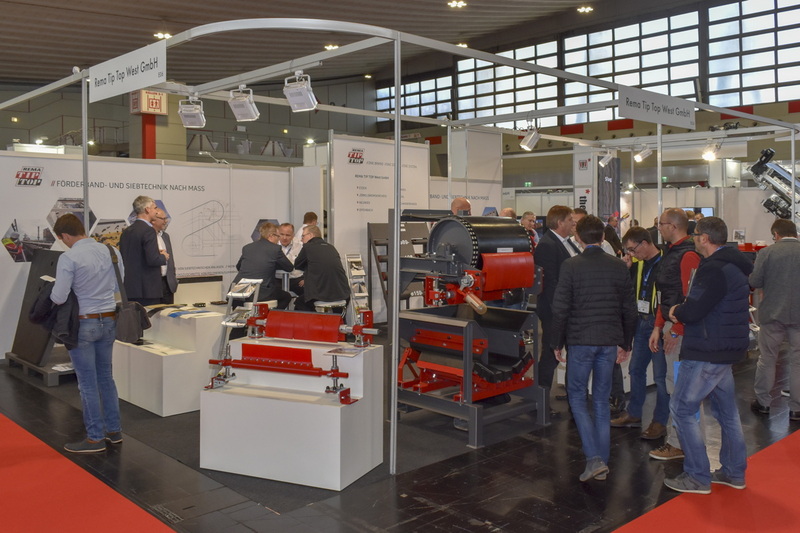 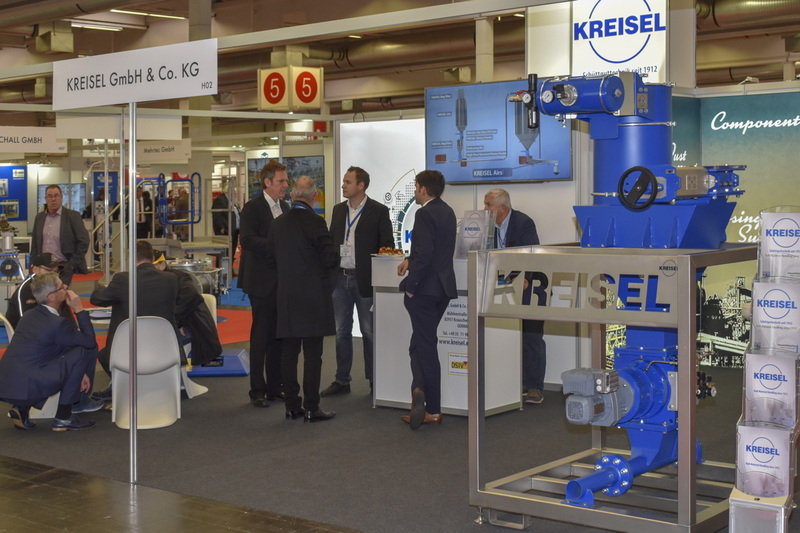 Russell Finex experienced sales engineers were at hand at Solids Dortmund 2018 to showcase the company’s screening solutions and engage with its potential and new customers. 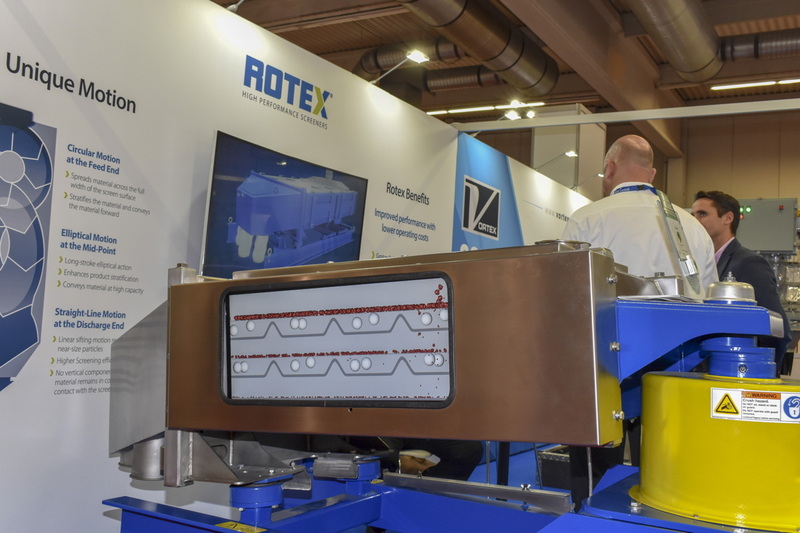 The Finex Separator™ is a high-performance separator providing sieving accuracy of wet and dry materials compared with traditional separators. 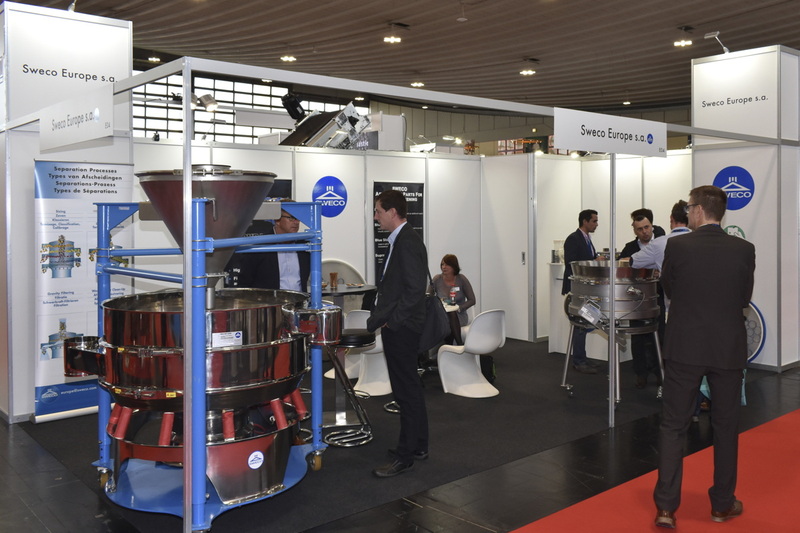 The Russell Compact Sieve® improves product quality by safety and check sieving your powders and liquid slurries. 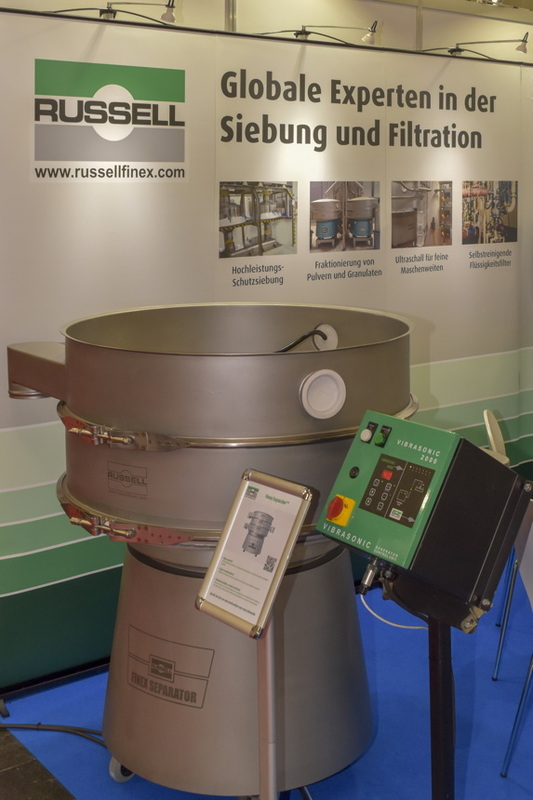 About Russel Finex: As worldwide leaders in fine mesh separation technology, designing and manufacturing vibratory sieves, separators, ultrasonic mesh deblinding systems and liquid filters for use throughout the processing industries, Russel Finex equipment is engineered for a global market and is supplied to over 140 countries. 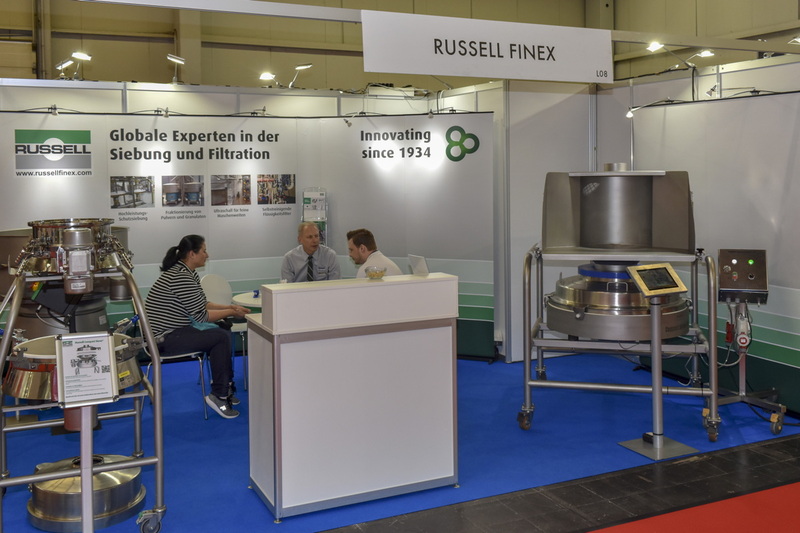 Russel Finex has companies in the UK, USA, Belgium, India and China, as well as a far reaching network of experienced agents and distributors across the world. 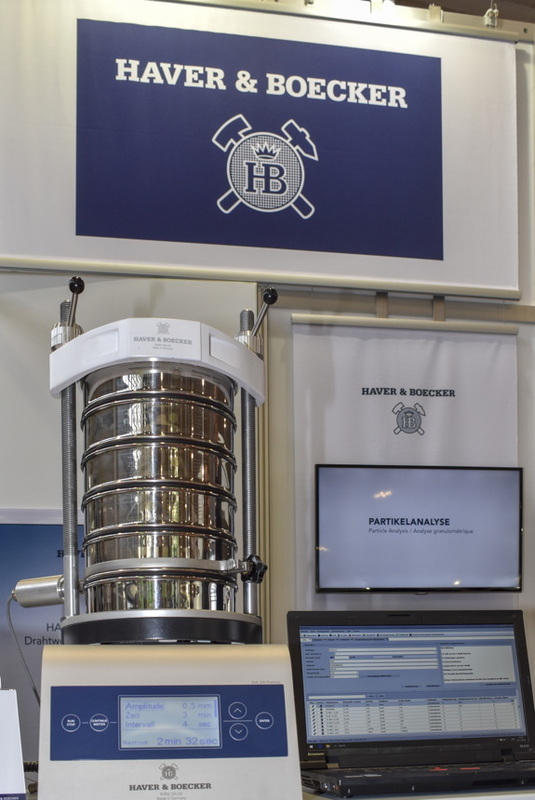 More information on Fr. 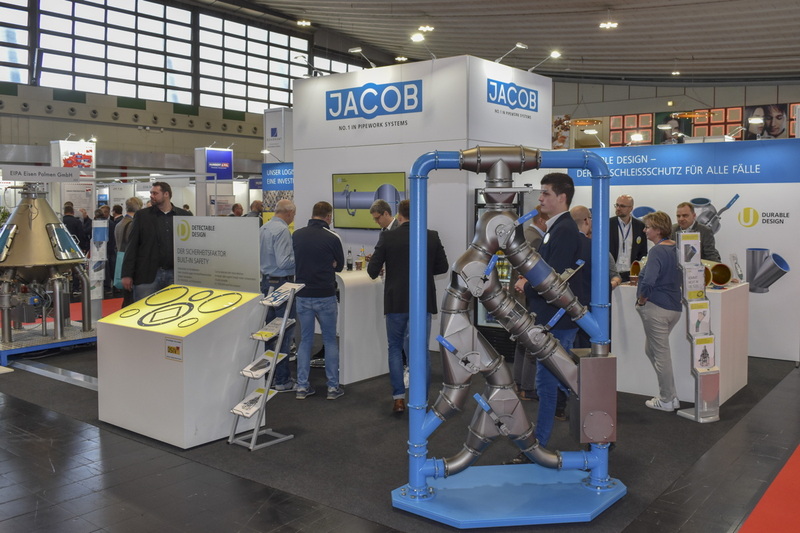 Jacob Söhne GmbH & Co. 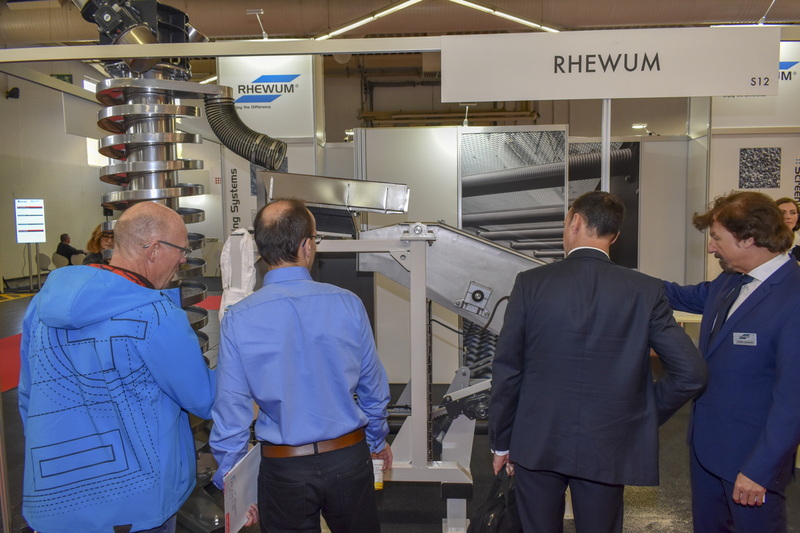 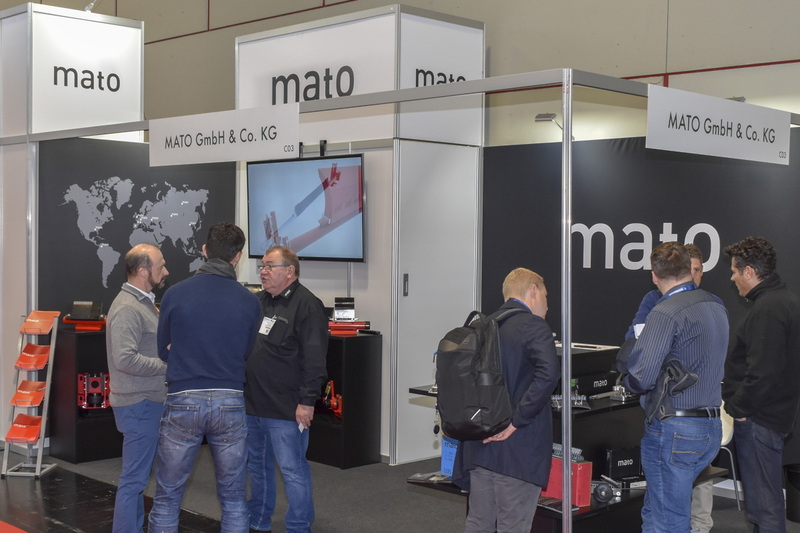 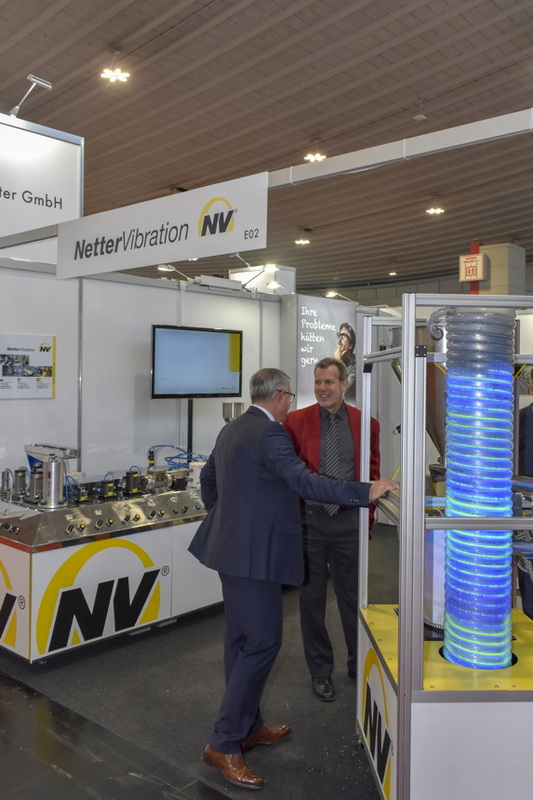 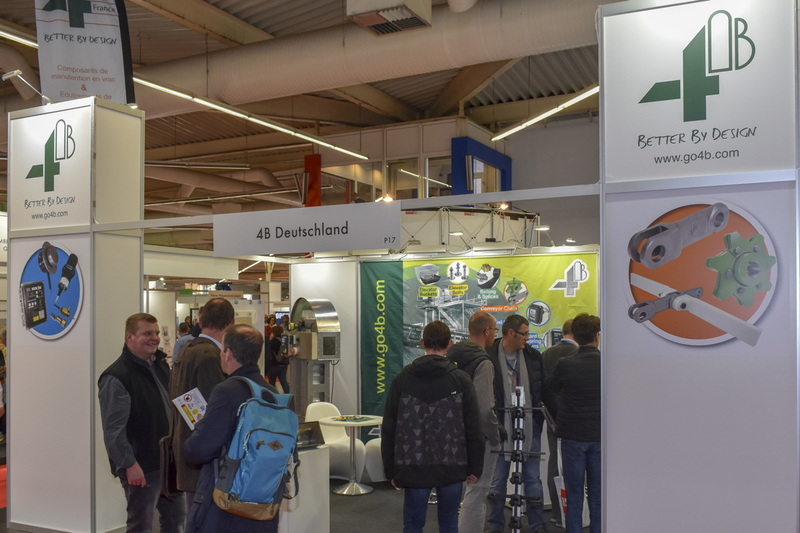 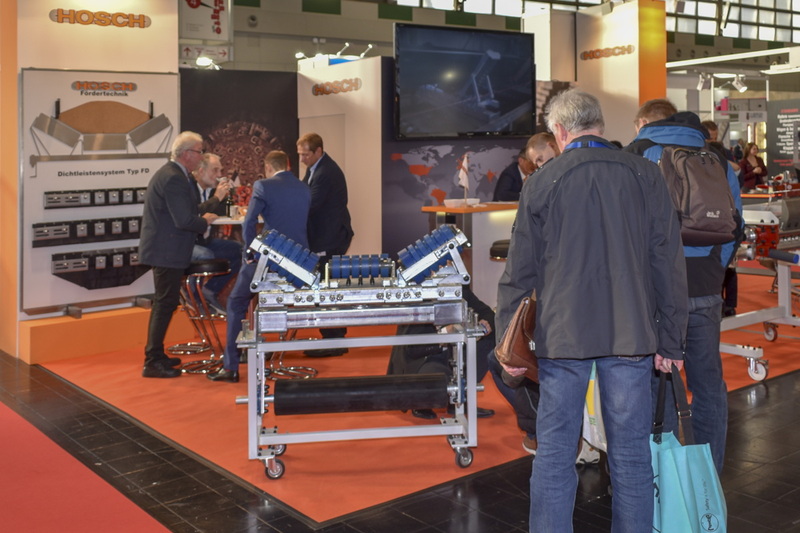 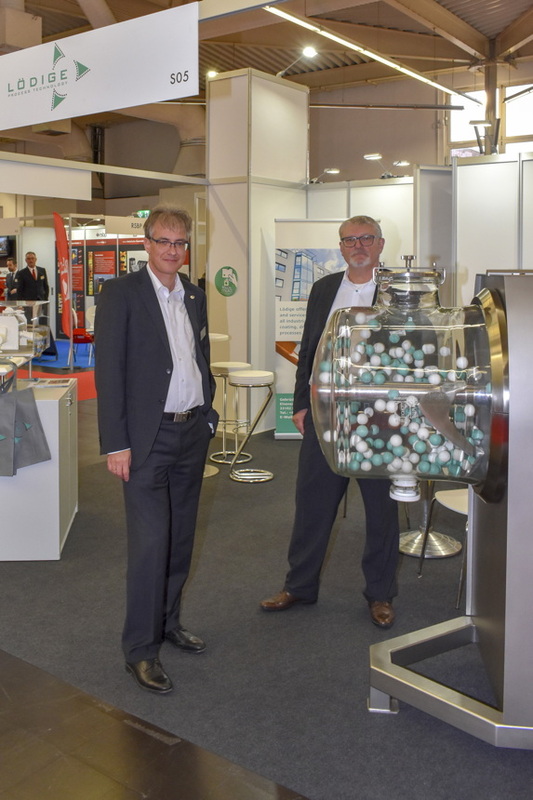 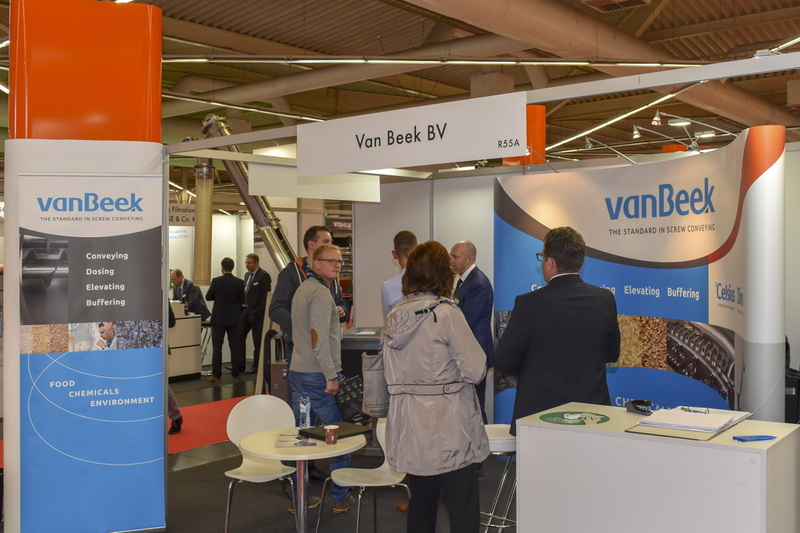 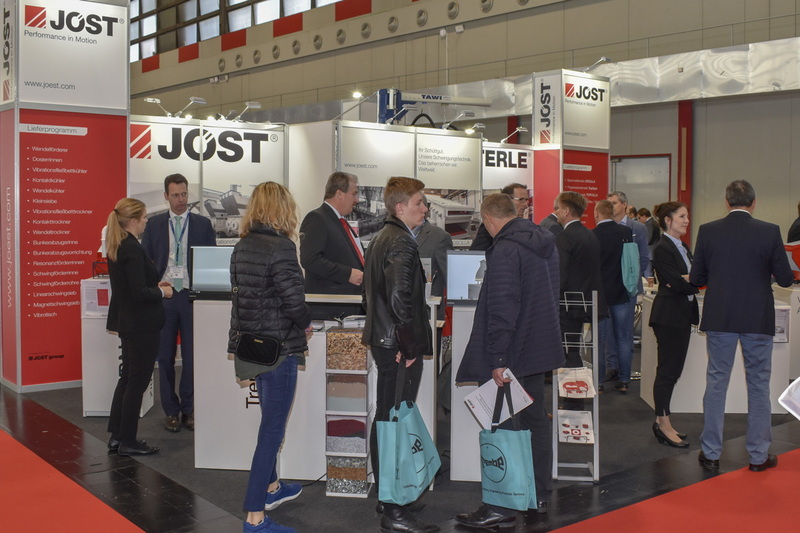 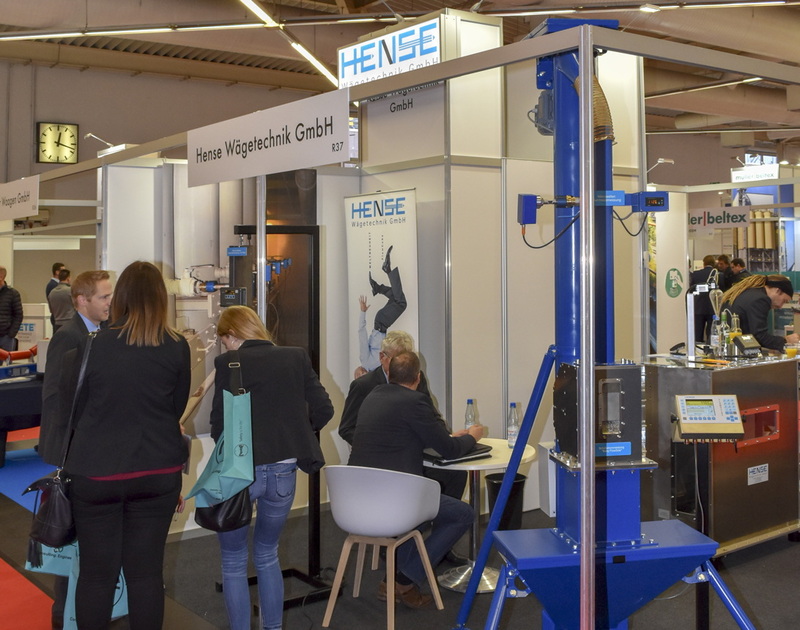 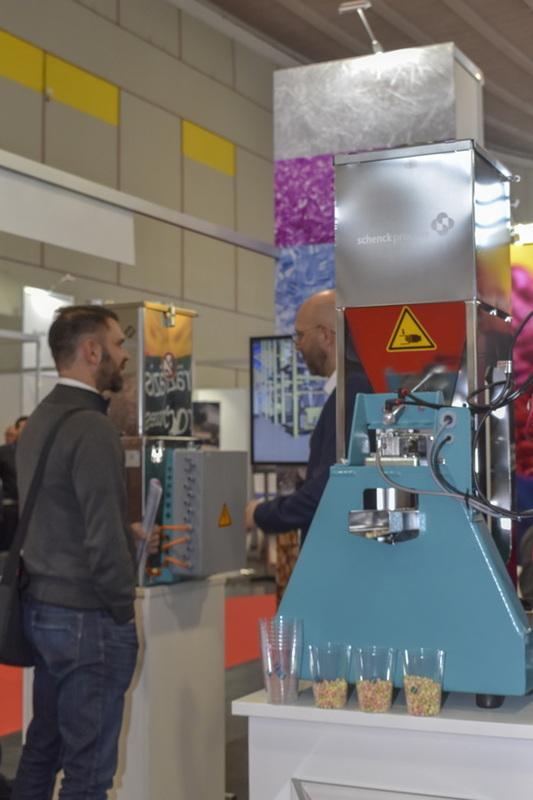 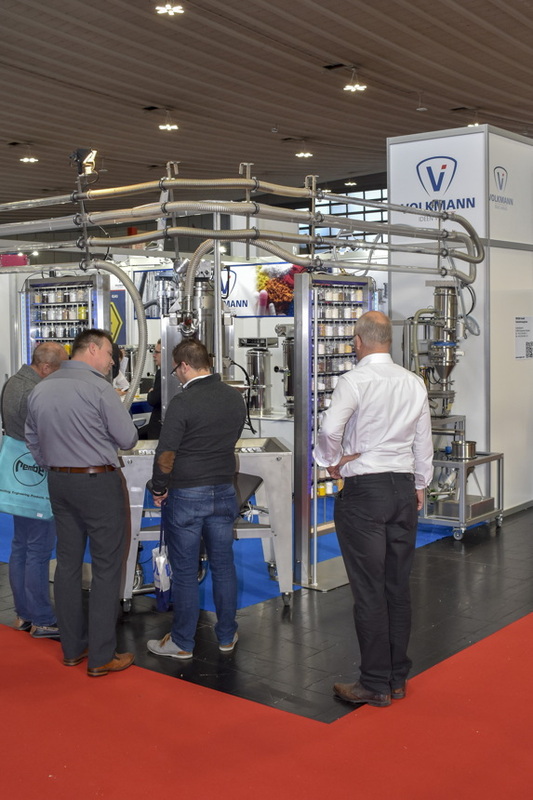 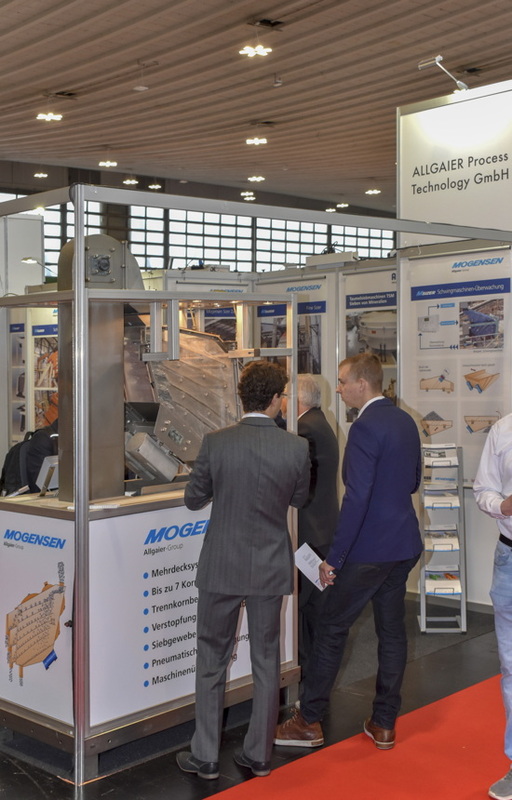 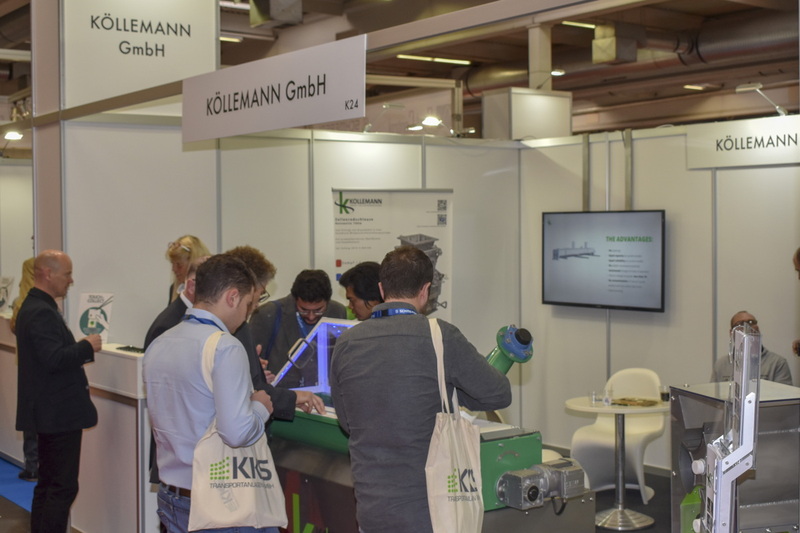 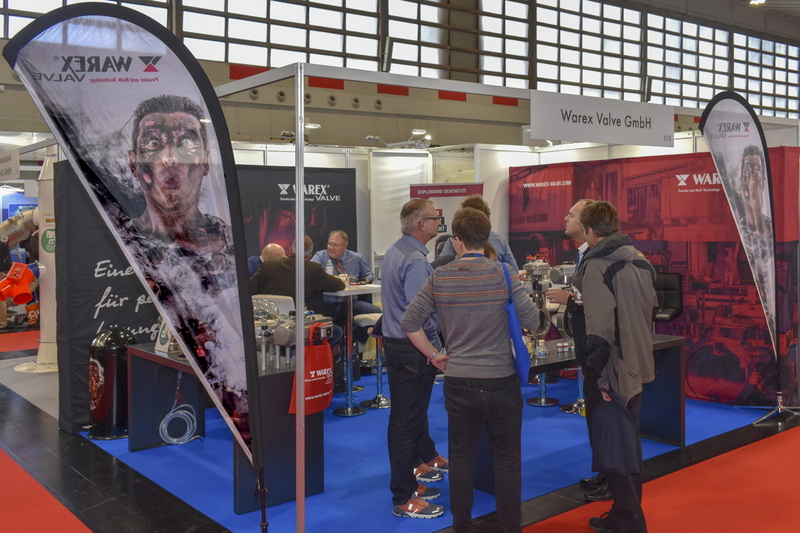 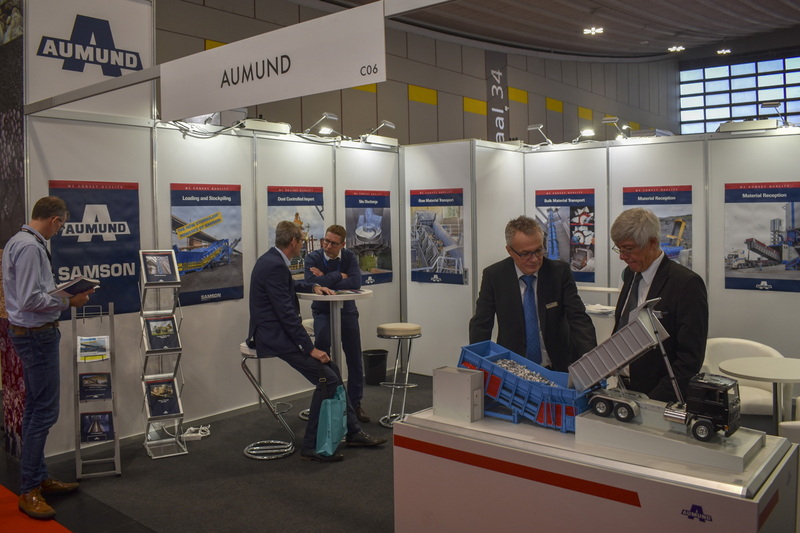 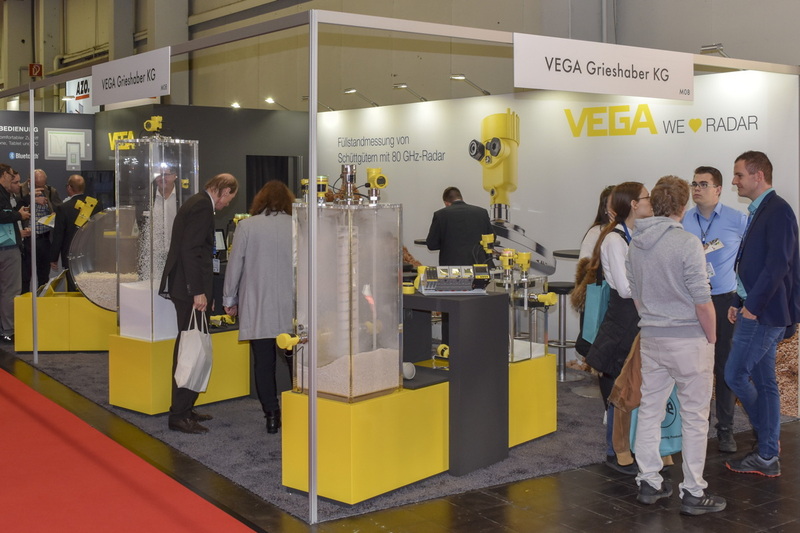 Previous PostSolids and Recycling-Technik 2018: Trade Show Duo in Dortmund a Hit with Visitors and Exhibitors alikeNext PostWAMGROUP: CEMA Screw Conveyor CAD Configurator Instructions by WAM Inc.